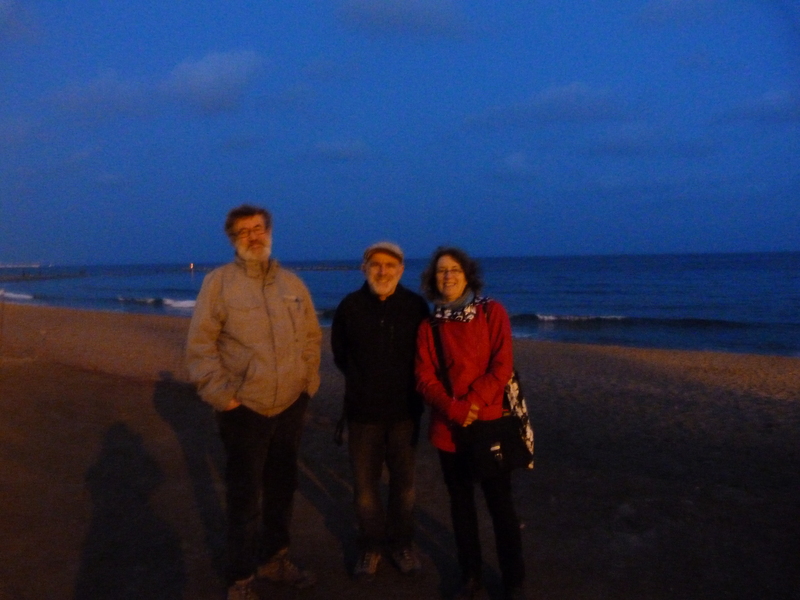 Our friends David and Hinda escaped the ice and snow of Canada to meet up with us in Barcelona. We share a love of architecture, art, food and wine. Barcelona was the perfect place to rendezvous. The first thing that struck us when we arrived was that the signs were in Catalan, English and Spanish. Barcelona is the capital of Catalunya, the centre of the world for more than 7.5 million Catalunians. Tim and I had been immersing ourselves in regional cultures of Italy but we had never been to Spain and thought of it as a solid mass. We were soon in a crash course learning about the exciting region of Catalunya. Plaça de Catalunya. The central Catalunian square. The city of Barcelona has a population of 1.7 million, but Barcelona’s influence and importance far exceeds its size with a surrounding metropolitan area of 5 million people. It is a city with a proud history, and a city that has made very conscious decisions about its growth. The city’s original Roman roots can still be seen in the Ciutat Vella (the old city). In the 19th century, L’Eixample (the expansion) was built to connect the old city with surrounding communities. 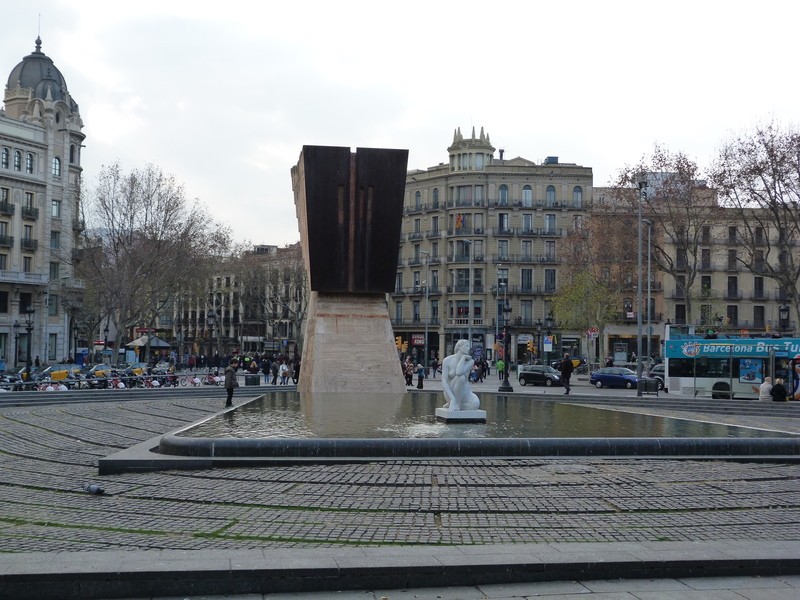 L’Eixample was designed along a grid system with the corners lopped off (chamfered corners). Buildings were built on these octagonal blocks and the resulting intersections are more spacious with greater visibility than in ordinary grids. Courtyards for residents were built in the centre of each block, and the whole area was designed to ensure that there were markets and schools within each 10-block radius. It is a city with a fascinating mixture of styles, architectural ideas, city planning and happenstance with the people placed firmly at the centre. 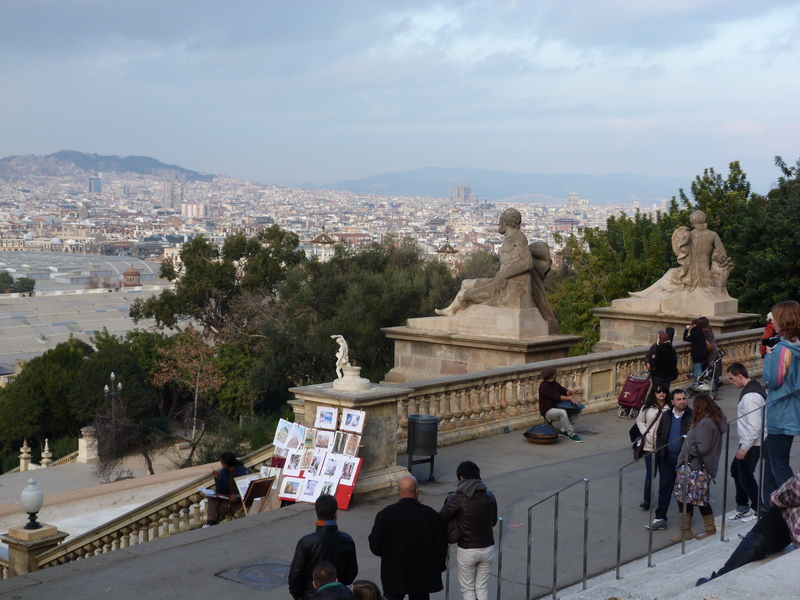 We began by taking the funicular up Muntanya de Montjuïc. The original fortifications for the city were built here, affording a view of the city and the port beyond. 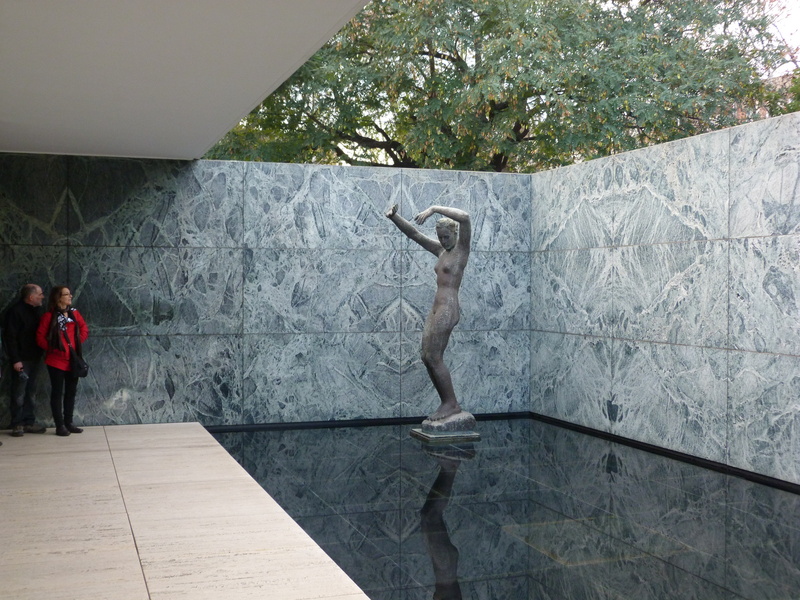 Walking through the gardens we began to get a sense of the city as we headed for our first architectural pilgrimage, the Mies van der Rohe “Barcelona Pavilion”. 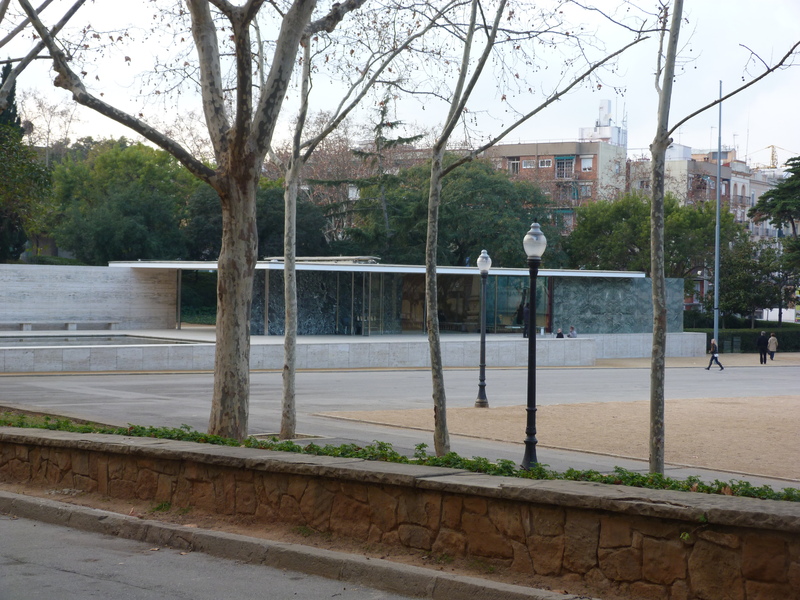 The Barcelona Pavilion was actually built as the German Pavilion for the 1929 International Exposition in Barcelona. An icon of modern architecture, it is known for its simple form and straight lines that guide the visitor’s movement through the space. 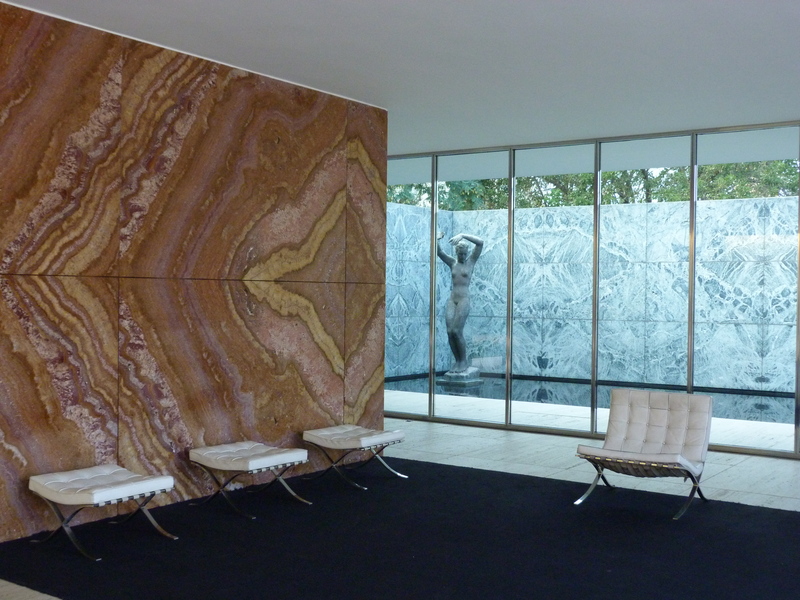 Made with marble, onyx, glass and travertine, it was designed to be the exhibit, not to house an exhibit. It contains a single sculpture and 4 “Barcelona Chairs” of van der Rohe design. It was envisioned as a “zone of tranquility”, for the weary exhibition traveller. The building was torn down following the Exhibition but reconstructed on its present site in 1983. Coming upon it as we did, in a park overlooking a city of curvature, of buildings created to mirror organic shapes and reflect human usage, it’s simplicity was a shock. By contrast, construction on the Hospital de la Santa Creu began in 1902 as a vast project to respond to the expanded needs of a growing city. Designed by Lluís Domènech i Montaner, the Hospital de la Santa Creu i de Sant Pau opened in 1930. With 48 different health care pavilions, it functioned as a city within a city, with ingenious tunnels between buildings and gardens and open spaces for patients. 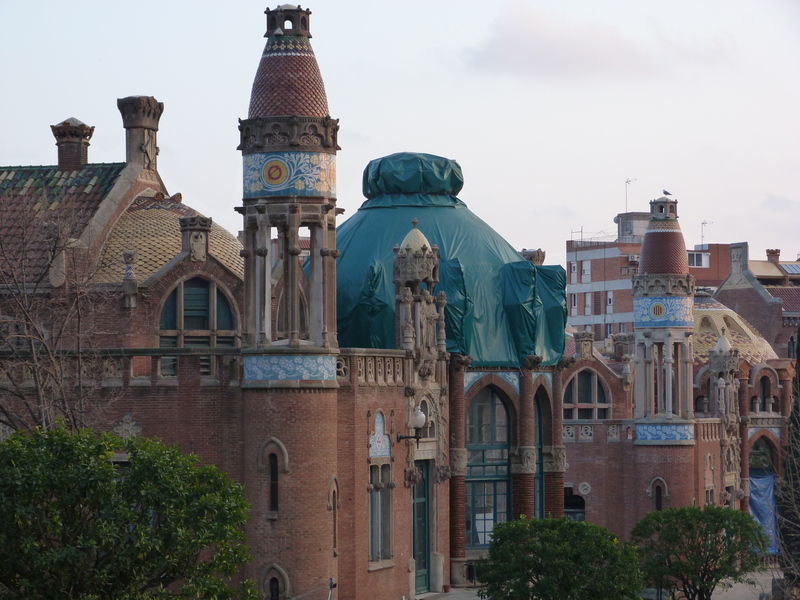 In 1987, UNESCO declared The Hospital de la Santa Creu i de Sant Pau a world heritage site. 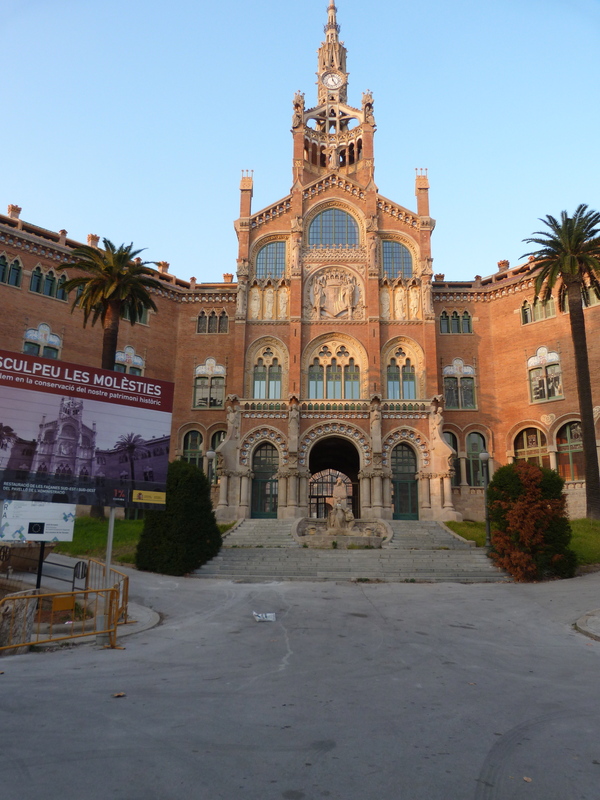 Hospital functions were moved to a new location and in 2009 a new project began, the Sant Pau Historic SiteThe original buildings are being restored, and will be the home for an exciting international think-tank. Working with the United Nations University Institute for the Alliance of Civilizations, Sant Pau aims to collaborate with various international organizations to generate new solutions for environmental, financial and social problems facing the Mediterranean. Through an alliance of nations and cultures, it is envisioned as an “incubator for new ideas”. “…different ways to approach the issues and find solutions, by mixing corporate enterprise with social groups, and by mixing social groups with international bodies, with universities, with centres of research…” Gemma Sendra, director of St. Pau’s Historical Site. Visiting the site, which is under reconstruction, we were struck by the beauty and the infinite optimism. This is a city that believes in its history and in its place in the world. The architecture is a home for ideas and it continually reflects the boldness of the city’s vision. We ended our day of architectural exploration with an evening walk along the boardwalk and onto the beach to see people building castles in the sand. A city of contradictions and passion made visible. A city of the people. 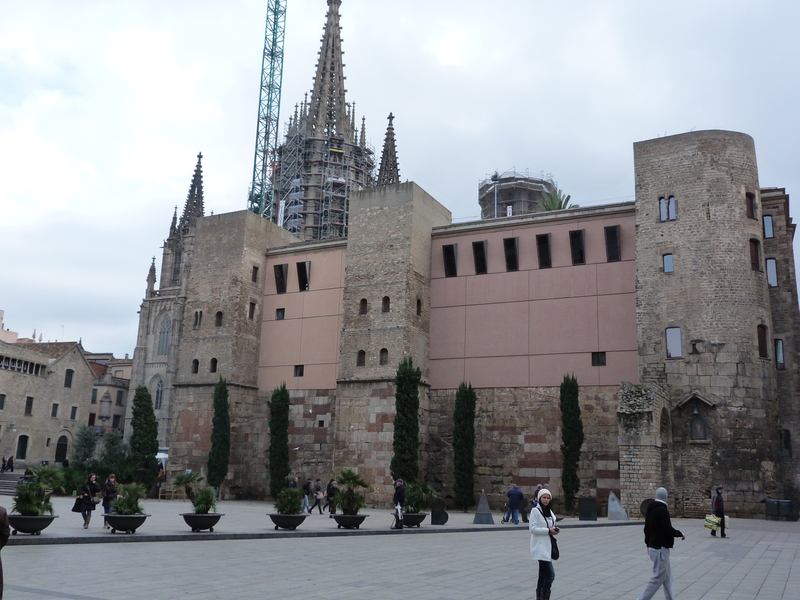 Author Amanda West LewisPosted on January 31, 2012 Categories Spain, UncategorizedTags Amanda Lewis, Barcelona, Barcelona Pavilion, Cataluyna, Hospital de la Santa Creu i de Sant Pau, L'eixample, Mies van der Rohe, Sant Pau historic site, Tim Wynne-JonesLeave a comment on Barcelona. Passion made visible. Finding good night life is a bit difficult in Venice at this time of year. We had arrived post Christmas season, and well before Carnivale. However, we read about an opera being performed in the Palazzo Barbarigo Minotto and decided to go. 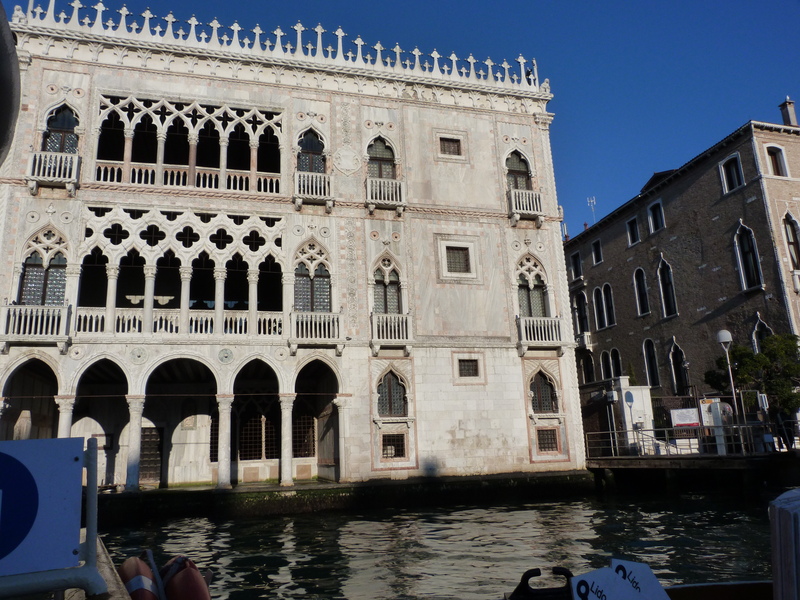 The tiny palazzo is not at all grand, nor easy to find. Knowing that it might be impossible to find at night (and perhaps a bit frightening, given the number of dark and tiny alleyways we had to go through), we spent part of an afternoon searching through a maze of canals and side streets. Our wanderings took us to a dead end, where we met a fellow tourist, also looking for the palazzo. She had been assured that this was the location. And although there were no markings or signs, we agreed to come back that evening. We arrived early, 7:00, to find a single light at the end of the dead end, and a sandwich board with information about the opera. We pressed a buzzer, a gate unlocked and we were guided through a courtyard, up a massive staircase, to a Baroque drawing room where we paid for our tickets. We were advised to return at 8:00, which we did, and joined 38 other audience members for an intimate evening of La Traviata. The opera was scaled down and performed by only 3 singers, who were accompanied by 4 musicians (violin, viola, cello and piano). Act One took place around a grand piano in the drawing room. Lit by candles, we were complicit in the action, with Violetta handing a Prosecco to Tim as part of the action of the play. We moved to a smaller drawing room for Act Two, where Violetta could compose her tragic letter to Alfredo. Act Three took place in a marvelously decrepit boudoir, cracks in the plaster, smokey trails on the walls, with a huge bed for Violetta to sing and die on. The whole experience was absolutely marvelous, the soprano’s high notes almost blasting our brains out in that small space. “Musica a Palazzo” regularly performs different opera evenings in Palazzo Barbarigo Minotto. Click the link and watch their trailer to get a feel for what they are doing. It was a treat to be in this environment and a unique way to experience opera. The other great musical treat of our stay in Venice was “Le Quattro Stagioni di Vivaldi”, the Four Seasons, performed by the San Marco Chamber Orchestra in the church of Ateneo San Basso. 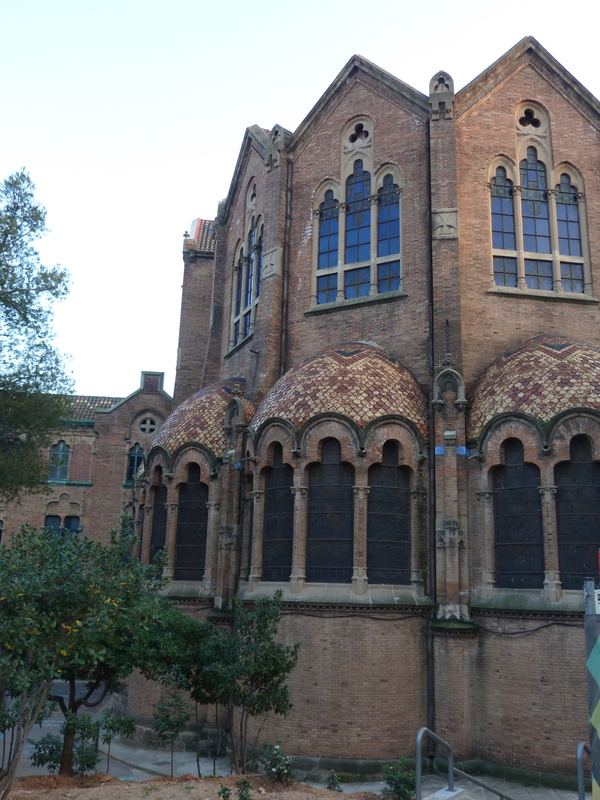 Originally built in 1076, the building is no longer a church but is used for classical music concerts. The San Marco Chamber Orchestra works to reproduce the conditions under which Vivaldi’s music was first performed and the Ateneo San Basso has the exact same dimensions as the Pieta Institute Music Hall, where Vivaldi composed. The concert was sublime. Growing up on the Four Seasons and overwhelmed by CBC’s incessant playing of various seasons, neither of us had ever seen the concertos live. It was like a dance between the soloist and the two violins, viola, cello, bass and harpsichord. We were carried away with the emotion, with the technical virtuosity, with the layers of sound. 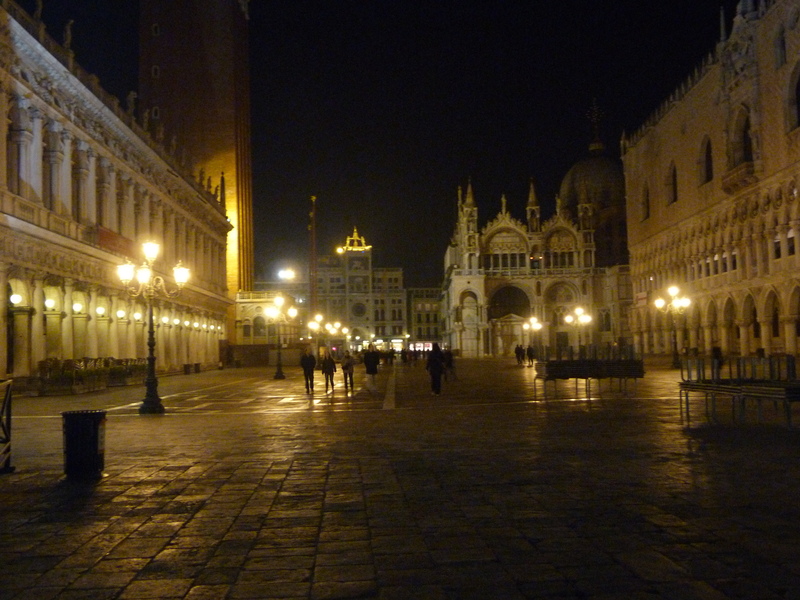 We walked out into the night of San Marco and it all made sense. The music, the architecture, the art. Leaving Venice was very, very hard. We wanted to treat ourselves to what we hoped would be a special meal for our last night. 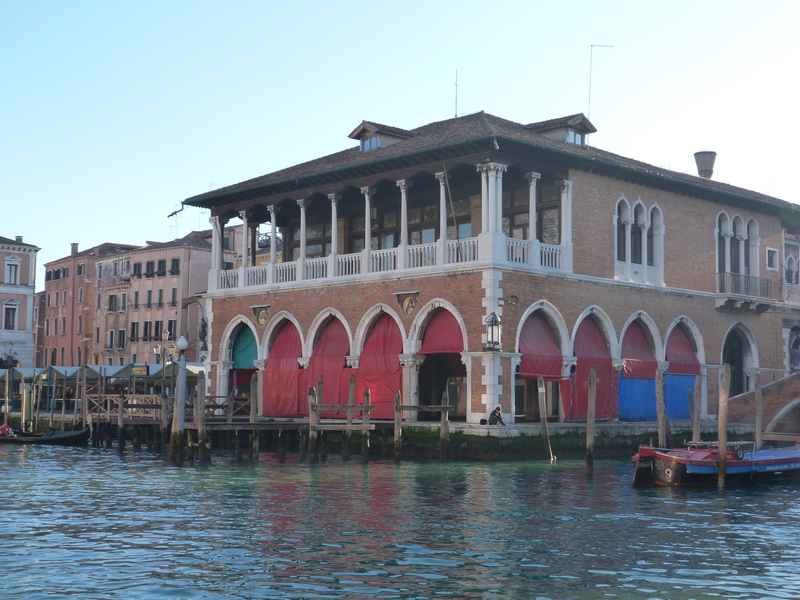 In general, Venetian restaurants were overpriced, with uninspired food and arrogant waiters. We decided to try “Gam-Gam” the Kosher restaurant just down the street from our apartment. It was by far the best meal we had in the entire time in Venice. We had gotten used to small, unappealing portions and so were stunned when our huge Contorni arrived. My “Eggplant, Ghetto Style” was in fact 4 different eggplant dishes which included baba ghanoush, marinated eggplant slices and baked eggplant with tomato. Tim’s Hummous with mushrooms included piles of hot, freshly baked pita breads. The main course of Tagliatelle with Salmon was lemony and light, one of the best pasta meals I have ever tasted. Tim had the exquisite Cous-Cous with fish, harissa sauce and vegetables. Our sorrow was that we were too full to face the Dolci Ebraici, assorted cookies and cakes that looked fabulous as they passed by our table. 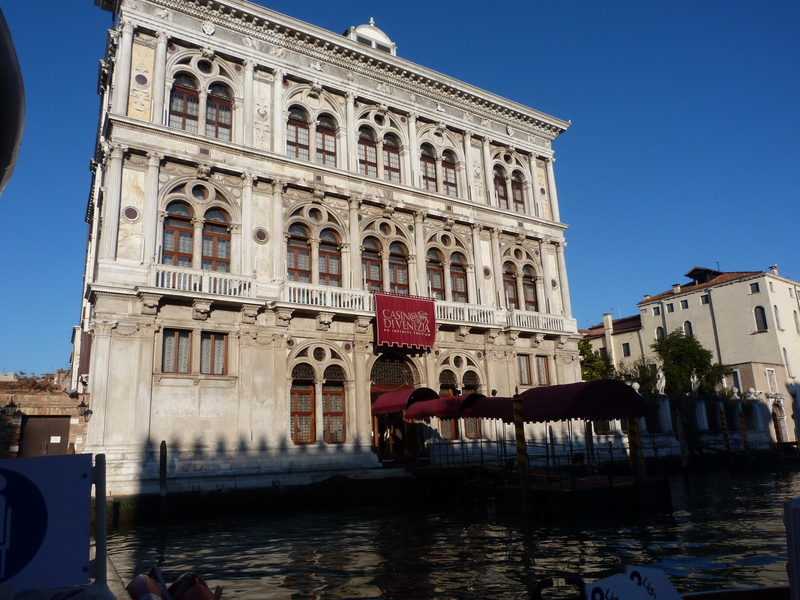 We were delighted to find a restaurant that we know we will go back to, soon, on our next trip to Venice. Amanda on a bridge. Looking forward to another time in Venice. One of the reasons why Venice was so successful as a republic was its unique governance structure in which the merchant aristocracy was closely involved in the rule of the city. 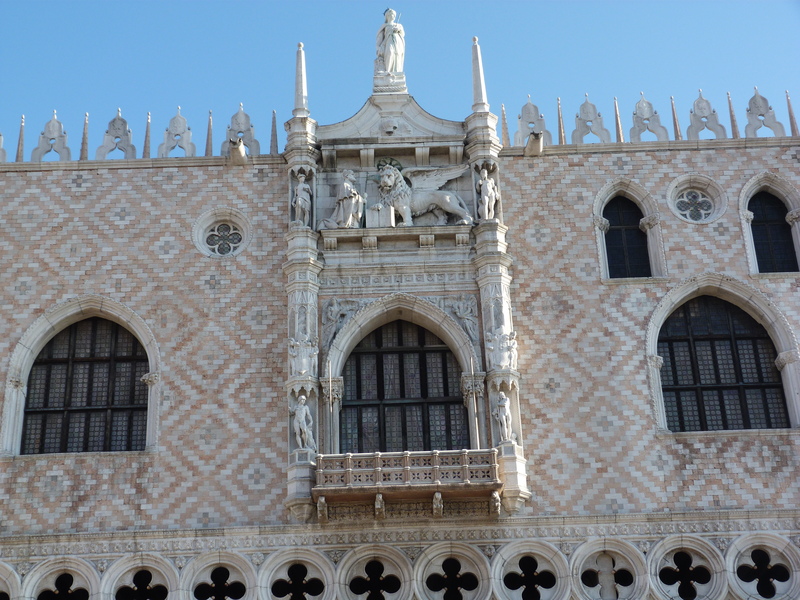 At the head of the republic was “Il Doge”, the Duke, and the Doge’s palace, “Palazzo Ducale”, was the seat of power. Meant to impress visiting dignitaries, it is overwhelmingly impressive to lowly visiting tourists. Venice was the centre of the universe. Covering the walls of the Map Room are huge 16thcentury maps of the known world, with everything radiating outwards from Venice. The palace is filled with paintings by Titian, Veronese, Bassano, and Tintoretto, everything placing Venice at the centre of the action. Every room is filled, every corner has detail, and excess is the model. Eve in the garden. Detail on one of the pillars of the Palazzo Ducale. Each pillar is carved with different images, different stories. The Sala del Maggior Consiglio is the largest room in all of Europe, 53’ long x 25’ wide x 12’ high. Tinteretto’s painting “Paradise”, covers one entire wall and is the largest canvas in the world. The room was designed to hold over 2000 men from the merchant aristocracy who came on a weekly basis to share in the governing of Venice. It is unspeakably vast, as though a whole piazza was put inside the palace. There are portraits around the walls of all of the known Doges, all except for Doge Marin Faliero who, for attempting a coup in 1355, was labeled a traitor and beheaded. He was placed in damnatio memoriae meaning that his name and image were totally expunged. He is represented by a painting of a black cloth, with the irony that it ensures that his name and deed live on in tourist books. Criminality was on our minds as we wound our way down to the prisons. 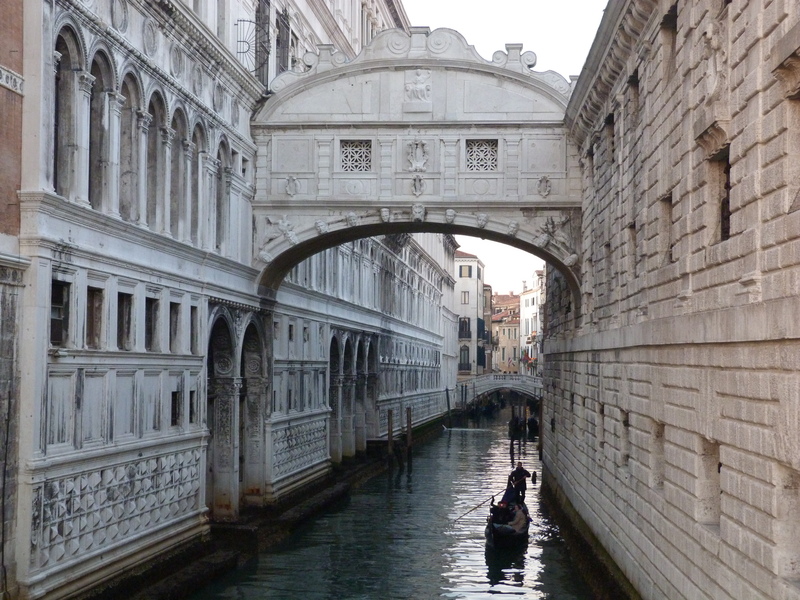 We walked across “The Bridge of Sighs”, named so by Bryon as the bridge was the last glimpse that a prisoner would have of the outer world as he travelled from the criminal court to the wet, stone cells beneath the palace. Apparently acclaimed as a paragon of comfort in the 17th century, the cells were cold, dark and cramped, with graffiti carvings and charcoal drawings by 16th and 17th century prisoners. We were relieved to make our way back to the sunshine into the vastness of Piazza San Marco, Napoleon’s “drawing room of Europe”, the place to see and be seen. Peggy Guggenheim knew all about being seen and about showing what was important to be seen. 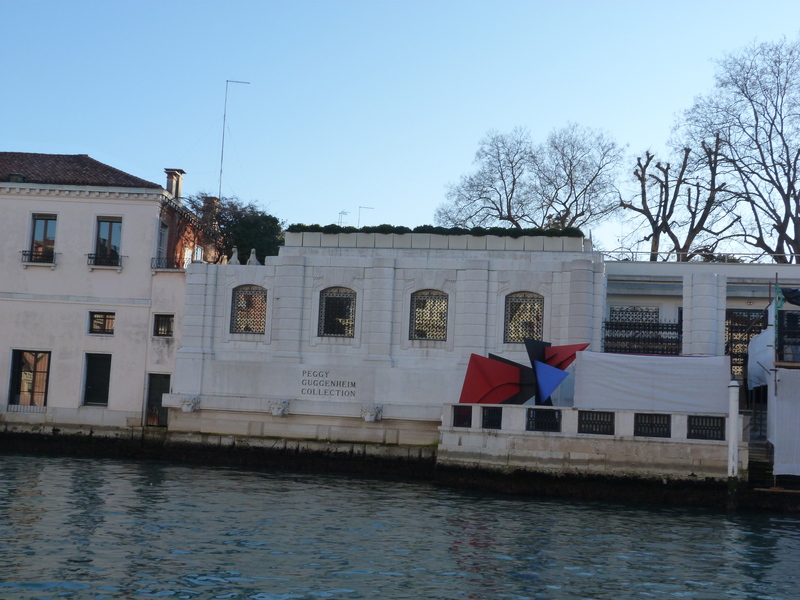 The Peggy Guggenheim Collection of 20thcentury European and American art is in her Palazzo, where she lived and collected art for over 40 years. An heiress who met and worked with all of the important visual artists of the 20th century, she brought modern European art to America and American art to Italy. The café in the museum is filled with photos of her at the palazzo – standing beside her Calder bedstead sporting her Calder earrings, or in front of the fireplace with the Brancusi sculpture on the hearth. The current exhibit is “The Avant-Garde, from Picasso to Pollack”. It is a personal and moving collection, a wonderful balance to the excess at Palazzo Ducale. The Guggenheim palazzo was under restoration, so we were not able to visit all of the magnificent rooms, nor visit Peggy’s simple grave in the garden. (As one guide book quipped, it is the only gallery in the world where the patron is buried out back). But even with that, it was one of the best gallery experiences either of us have ever had. Her artistic eye led her to collect pieces that made a profound impact on 20th century art. She was a visionary who helped us to see who we are. Even in January, Venice is filled with tourists. While the Piazza San Marco holds architectural wonders, we wanted to continue to enjoy the quiet nooks of Venice wherever possible. 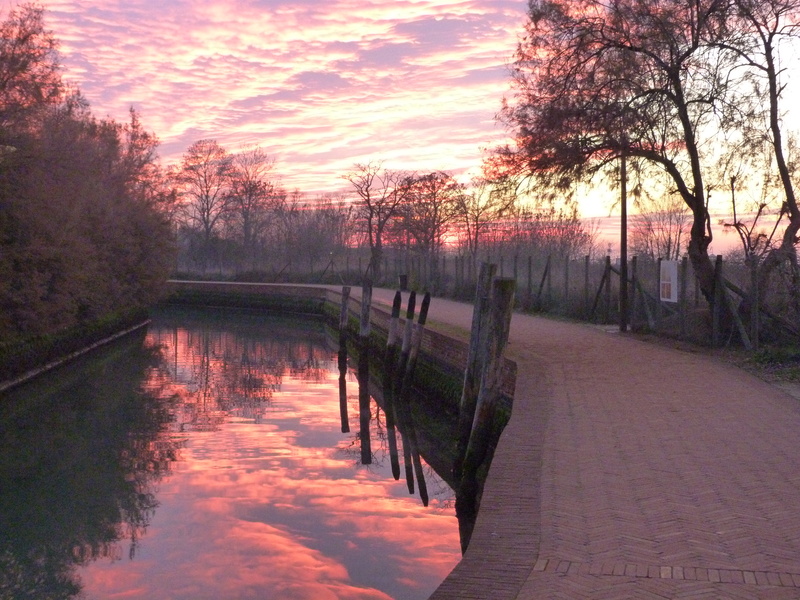 The Venetian lagoon, at 520 square kilometers, is the world’s largest wetland. The islands are mostly empty, sporting bits of crumbling masonry from centuries gone by. They are used by the local population for picnics and for fishing. But there are a few islands where people live and one very important island for the dead. We started the day on Cimitero di San Michele, the cemetery island. The Roman Catholic church of San Michele in Isola was built on the island in 1469, on the site of an older church and in 1807, during the French occupation, the island was selected as the site for the city’s cemetery. Napoleon had decreed that it was unsanitary to have a cemetery within the city boundaries, so all cities had to move their burials plots outside of the city walls. It is a beautiful and peaceful place, with tall cypress trees and large topiaries. There are different sections – the sad children’s section, the Greeks and Protestants, the war veterans, the gondoliers. There were fresh flowers on many of the graves, and we shared the early morning boat with Venetians paying their respects. 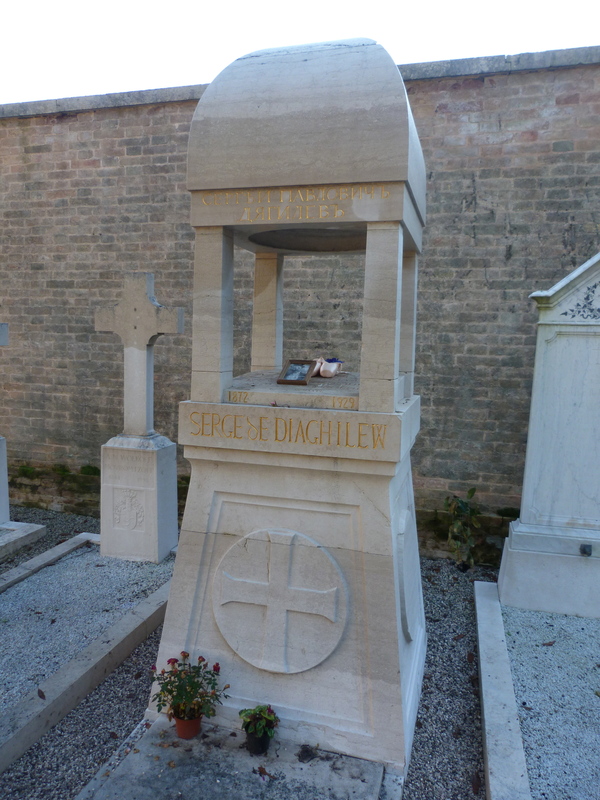 Cimitero di San Michele is the final resting place for a number of famous people who died in Venice, including Igor Stravinsky and Sergei Diaghilev. 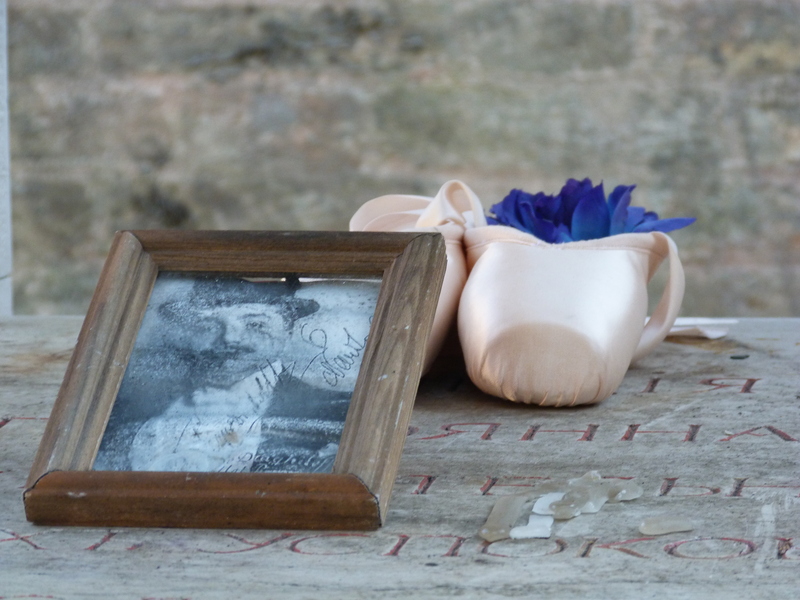 The pointe shoes on Diaghilev’s tomb were fresh and clean – clearly recently renewed. 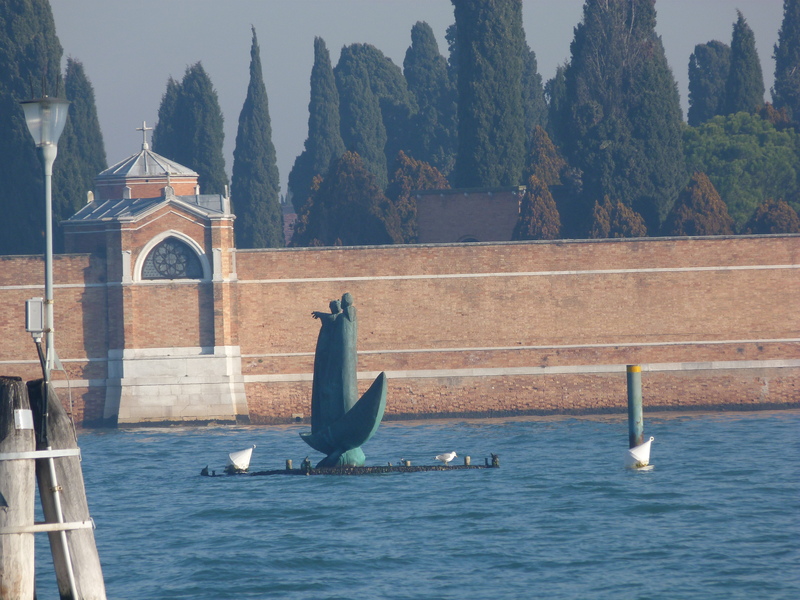 From Cimitero, we took the boat to Murano, the glass island. In 1291, the Venetian’s decided to move all glass making production to the island of Murano, for fear of the effects of a possible fire from glass factories in the main city. The expertise of the craftsmen flourished and by the 16th & 17th centuries it was the world centre for glass production. 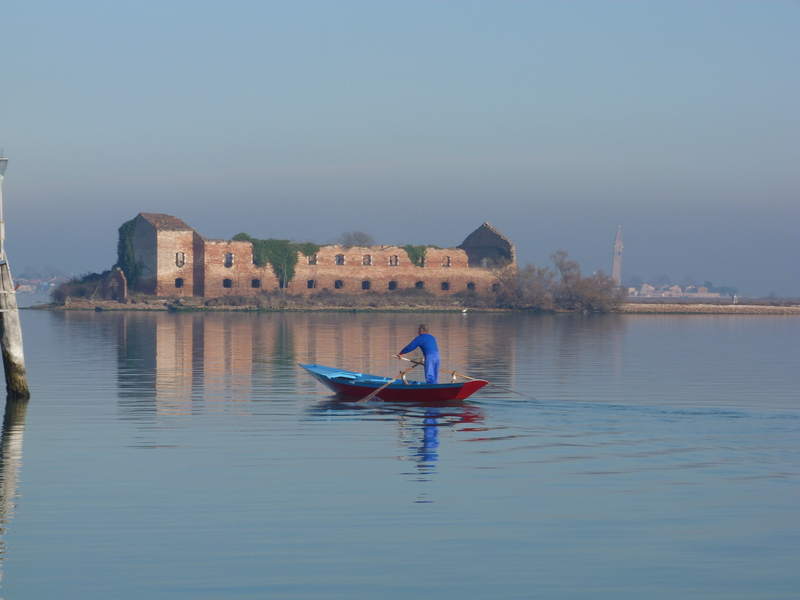 Murano trained craftsmen were not permitted to leave the island – anyone doing so was proclaimed a traitor. Today, the island caters to the tourist trade, with tours of the glass blowing facilities and stores selling an overabundance of mass market glass beads and knick knacks. In and amongst these, however, there are still fine craftsmen, producing unique and collectable art. Coming in the off-season, we were not harassed by glass salesmen and could enjoy walking around the island. 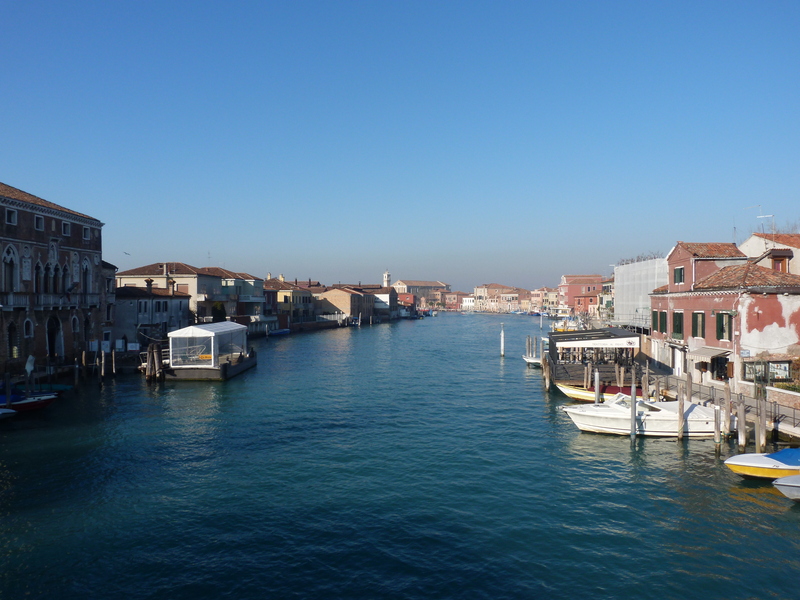 The Murano Grand Canal weaves lazily through the town. There’s a great museum on the history of glass, the Museo dell’Arte Vetrario, housed in the 17th century Palazzo Giustinian. With huge glass chandeliers, a great exhibit of early Roman glass, and fabulous contemporary pieces, the museum helped us to see past some of the tacky glass shops to the history and beauty of glass. 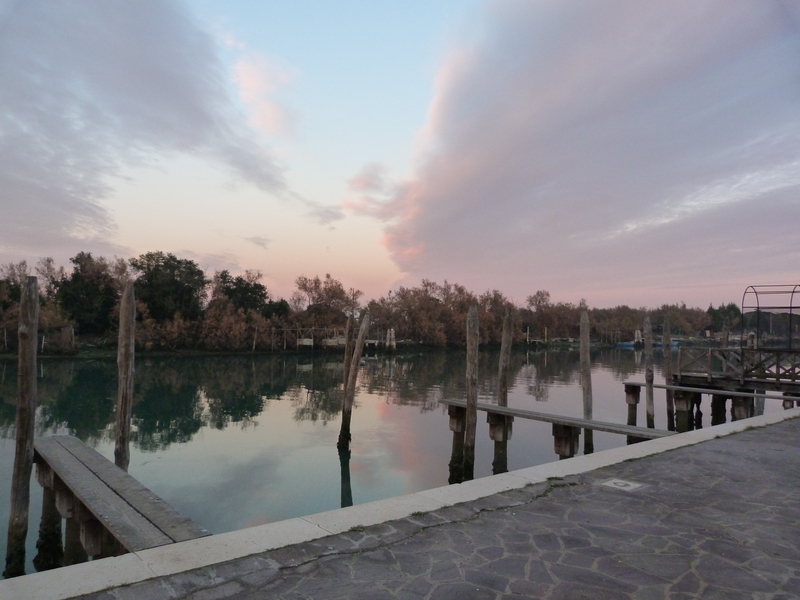 From Murano, we took the boat to the small island of Mazzorbo. Mazzorbo has no claim to fame, other than to be a quiet and tranquil place to live. It was settled around the 10thcentury, but is not at all built up. There are quiet garden plots, and little fishing boats. The 14th Century church of Santa Caterina still has its original bell, dating from 1318, making it one of the oldest in Europe. Apparently Winston Churchill, amongst many others, came here regularly to paint. 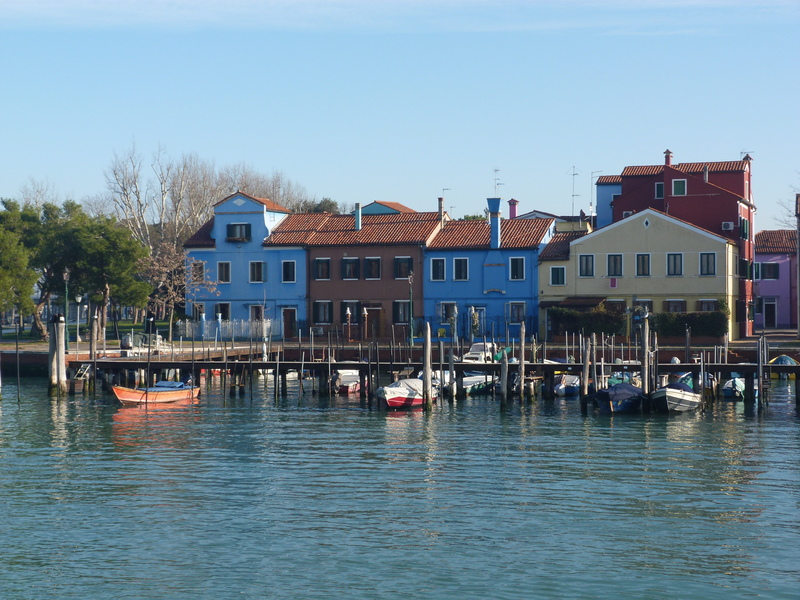 Yet you can walk through Mazzorbo in about 10 minutes, cross the lovely wooden bridge and arrive at the island of Burano. Burano is the lace island. It had a thriving lace industry in the 16th century, and an important lace making school in the 18thcentury, but today is mostly known for it’s colourful houses. The apocryphal story is that local fishermen all painted their houses bright colours so that they could see them from out in the lagoon. Apparently the colours are highly regulated now, and owners must apply to the local government to find out which colour they are permitted to paint. Because we were visiting in the off-season, the island was even quieter than normal. We found a great place to have some lunchtime pasta, but the charm of the island was mostly in the walking amidst such exuberant and vibrating colours. 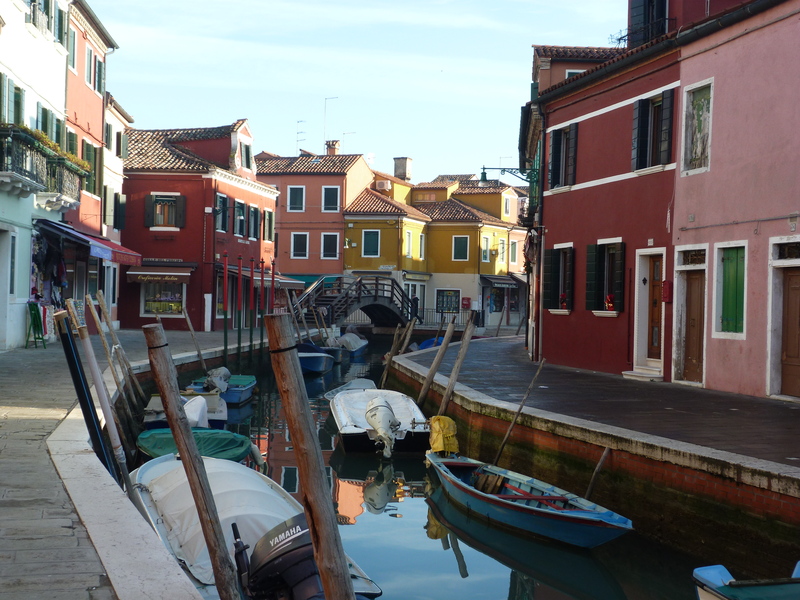 From Burano we took the ferry to Torcello, said to be the birthplace of modern Venice. It was founded in the 5th century by citizens of the town of Altino, fleeing from the mainland. In the 14thcentury there were 20,000 people living on the island. But it is the most boggy and marshy of the islands, and inhabitants suffered from the excessive mosquito population and thus plagues of malaria. Today the island is home to about 100 residents. In tourist season there are a couple of lovely places to eat, but when we arrived everything was closed and shuttered. 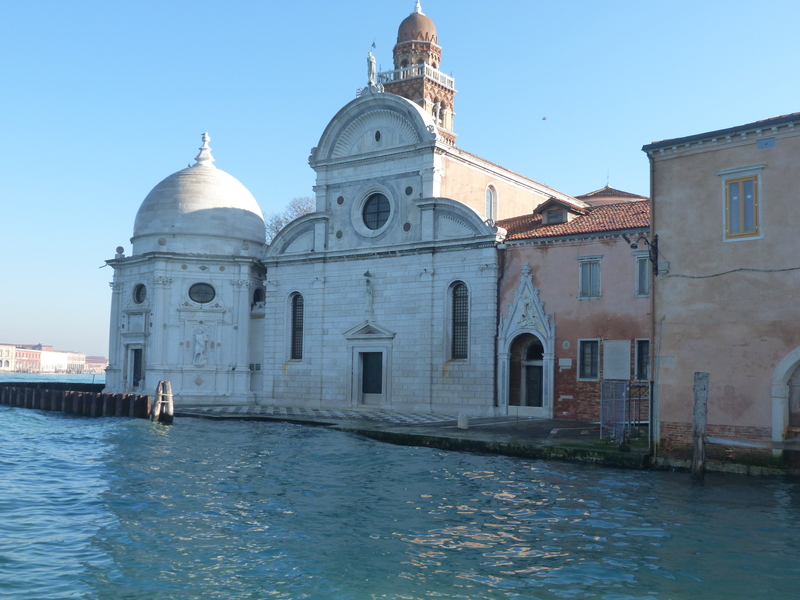 It was late in the afternoon and we were just in time to enter the church of Santa Maria Assunta, one of the oldest and most beautiful of all the churches we saw in our time in Venice. 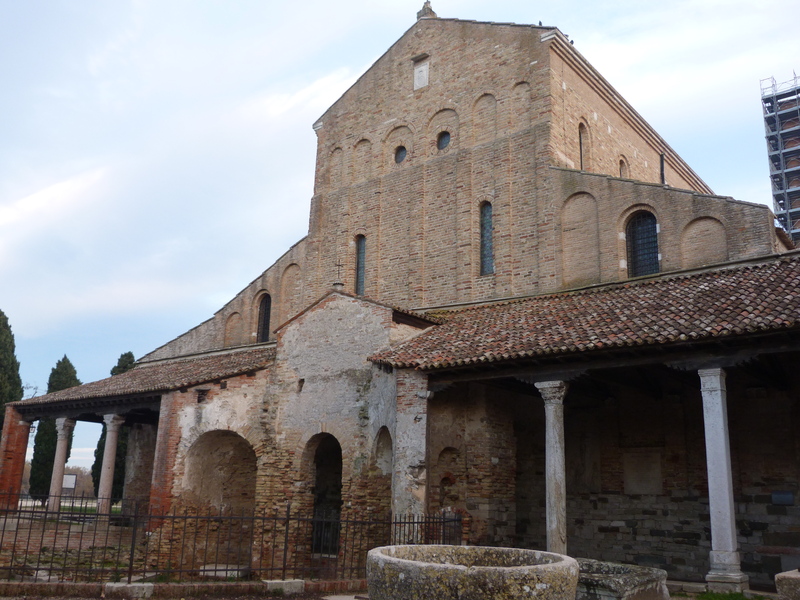 Santa Maria Assunta dates from 639 and has amazing floor, vault and wall mosaics dating from the 9th to the 12th century. A huge Romanesque/Byzantine wall mosaic of the Last Judgment covers one whole wall of the church and shows pictures of the blessed and damned, of heaven and hell. Sitting on the edge of a small, virtually deserted island, the church had a magical and spiritual feel that was stronger than all of the huge cathedrals in Venice combined. We walked back to the vaporetto dock into a magnificent sunset. We left the deep, murky mysteries of the lagoon and headed back on into the city, “the city of mirrors, the city of mirages, at once solid and liquid, at once air and stone.” –Erica Jong. We had travelled far. It is impossible to go to Venice without a preconceived vision. It must be the most painted, photographed, fictionalized and filmed city in the world. But it was still a shock. It was the most “foreign” experience I have ever had. One knows that Venice in on the water. But I don’t think I had really understood what that meant. On another planet, in another universe, perhaps all cities are built on the water. Here on earth, there is only one. The city of Venice is on a lagoon of 117 islands. While lagoon dwellers have lived there since the 10th century B.C., the impetus for modern day Venice began when people from northern Italy were fleeing Germanic and Hun invasions in the 4th century A.D. The early peoples brought wood from the forests of northern Italy and began the process of building on the lagoon and creating a unique world of interconnected islands. Their strategic position at the head of the Adriatic eventually gave the city naval and commercial supremacy and by the late 13th century, Venice was the richest city in all of Europe. 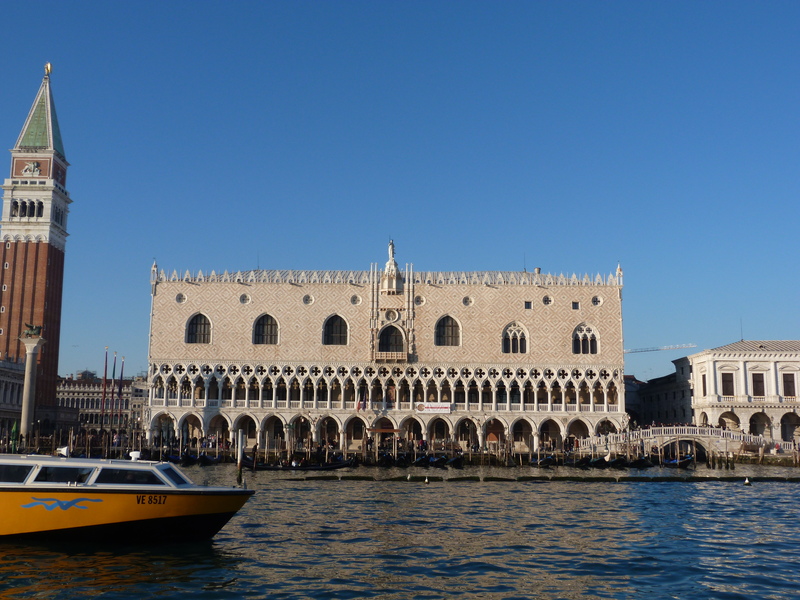 It was ruled by the “Great Council”, made up of all of the leading Venetian families. They vied with each other to build the largest palazzos (palaces), decorated with the work of the greatest artists of their time. But as with all empires, Venetian fortunes changed. Trade routes altered. Over a three-year period in the 16th century, the Black Death killed a third of Venice’s population. Venice would never have the same military force. But it has never lost its grace and beauty. Today, the city relies on tourism to keep it afloat, quite literally. Over 50,000 tourists visit Venice per day. We were, again, very glad to be visiting in the off-season. Of course, I love a good stage set. I love crumbling and fading beauty, where sculptures and painting are tucked in and around every façade. A world where attention is paid to every detail, and yet so little is kept in good repair. And I love living in a city with no cars, where early morning deliveries are made by quiet barges skillfully maneuvered through narrow canals. 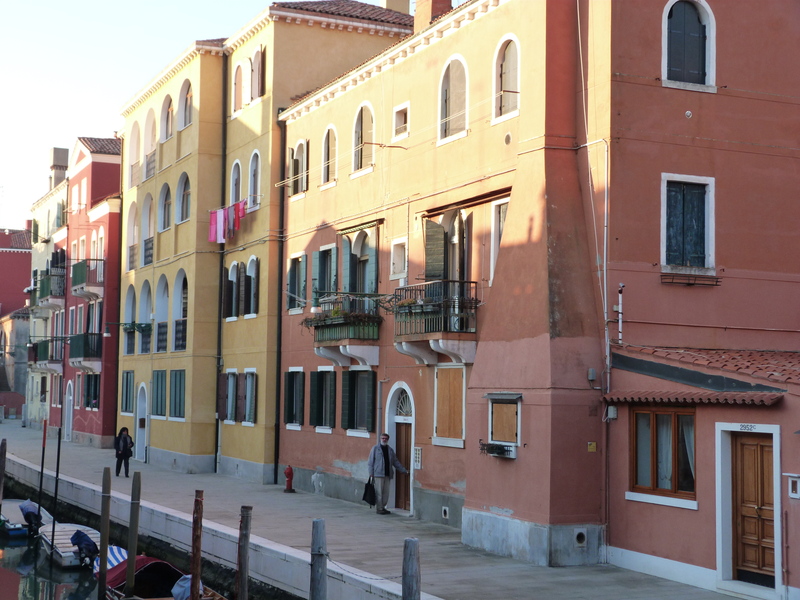 We had rented an apartment in the Cannaregio region, near the Jewish ghetto, away from the mad tourist dash of San Marco and the consumerism of the Rialto. Here, people were living their lives amidst the beauty and decay. There were little stores on every corner, with all manner of cheeses, meats and wines. There was a large fruit and vegetable market, fish market, bakeries and cafes. What more could a person ask for? The word ghetto comes from Venice. It meant iron foundry, a place where iron was cast (gettato). The foundry was in the island of Cannaregio until 1390. 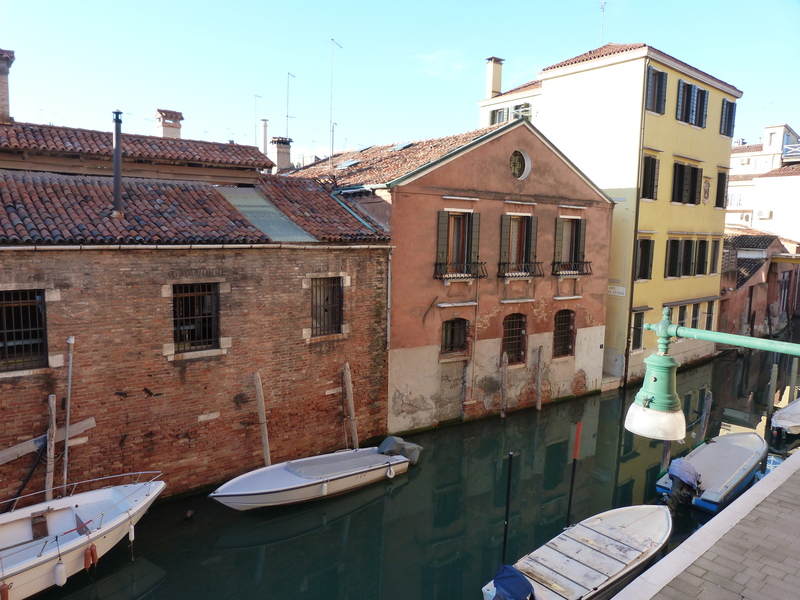 In 1516, the Jewish population was given permanent residency status in Venice, but they were confined to this area. 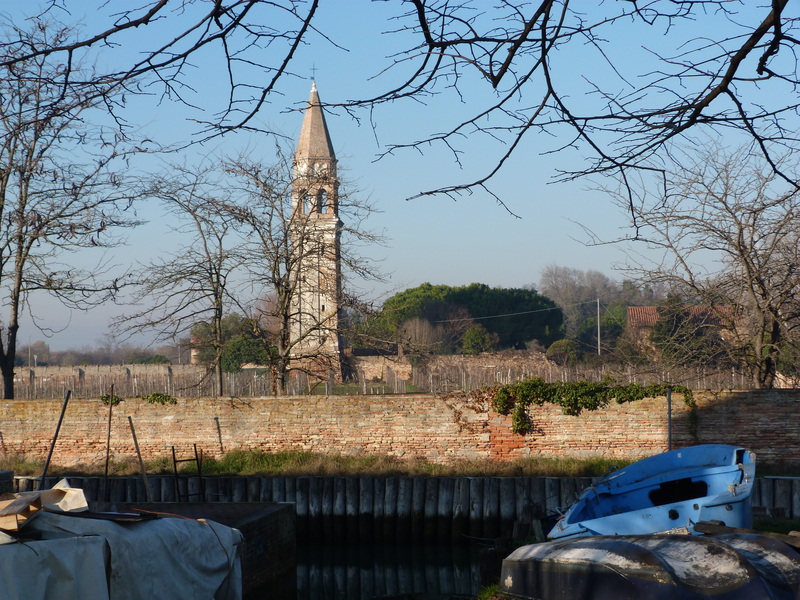 It was a haven for Jews who could take refuge here from other parts of northern Italy. But it also became a prison where the bridges were locked after dusk. It is the one region where there are tall buildings — since people were confined to a small area, they built upwards. It was not until the arrival of Napoleon in the 18th century that the Jewish population were given full rights of citizenship. 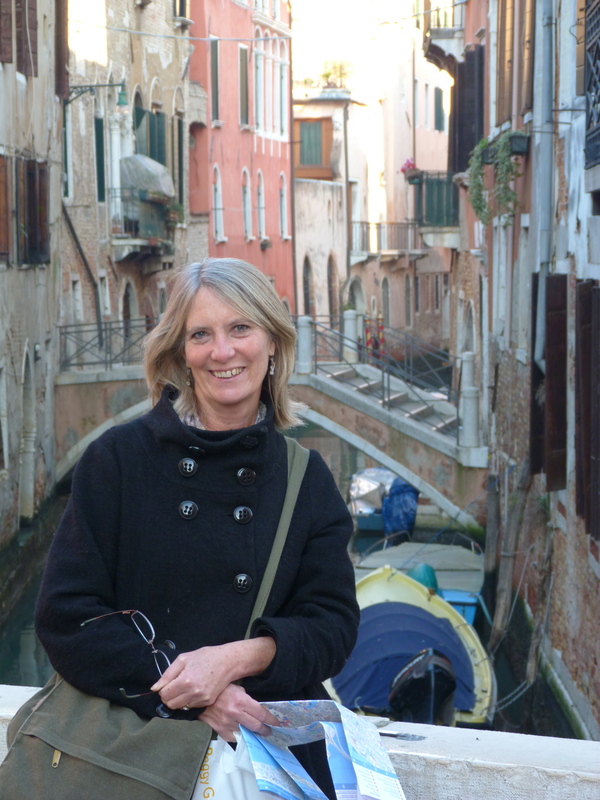 Many chose to remain in Cannaregio. 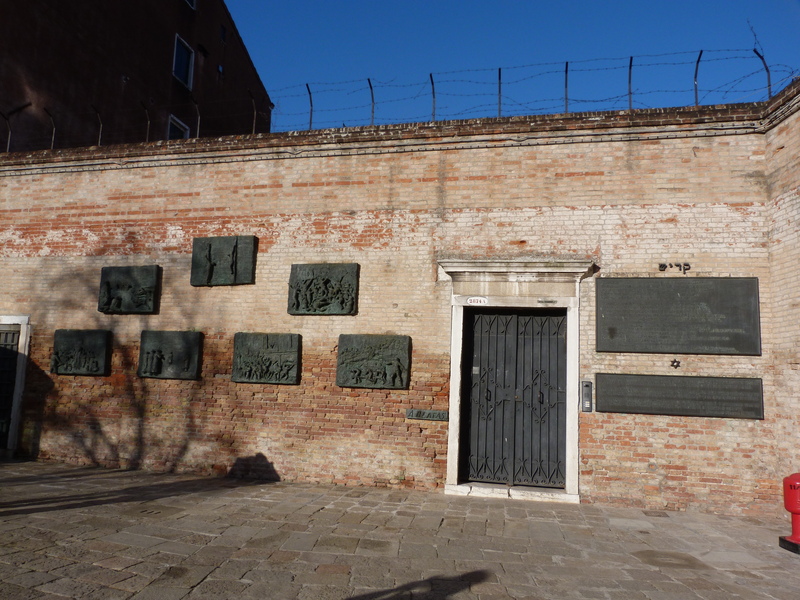 Living in Cannaregio, we decided to make our first stop a pilgrimage to the memorial for the 202 Venetian Jews who were deported from Venice to death camps in 1943. 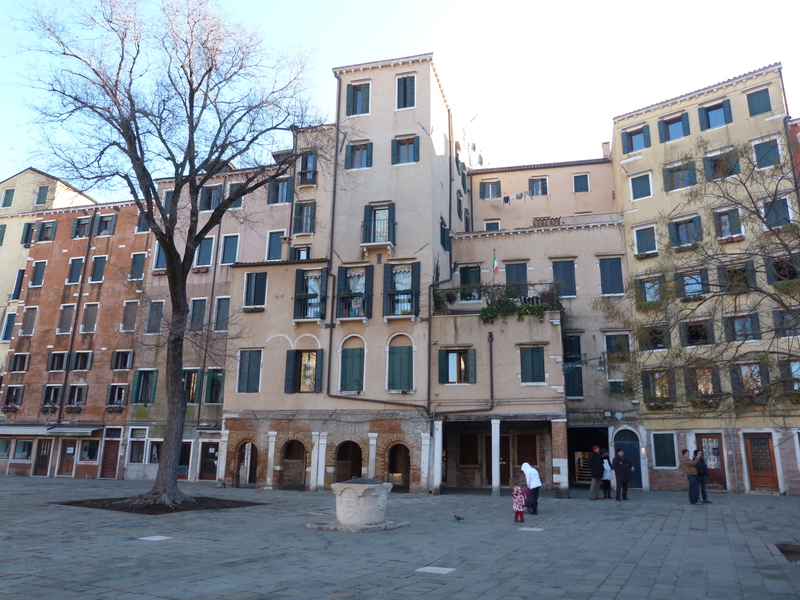 The central piazza in the ghetto was cold and still in the early morning sunshine. The memorial was overpowering. Venice is a city built on water, but it is also a city made for walking and getting lost. No street is straight or long. It is an intense maze in which a map is almost useless. We spent the morning walking. And walking. And walking. Trying to get a sense of the geography, and realizing that it is more like understanding a forest than a city. Learning to recognize shapes, trusting more to instinct than reason. So we switched our perspective and took a trip through the city by boat. At 75 euros for 50 minutes, we couldn’t afford a gondola, but for 6.50 euros we could take the vaporetto (the water bus) through the city, enjoying the twists and turns of the Grand Canal. We armed ourselves with a great guide book and Tim read through the “tour” as we went along. The perspective on the city is entirely altered from the water. Grand entrances, designed for water access and invisible from the streets, are revealed in all their glory. Commerce and daily lives are conducted here. The fish market. Where fish can be unloaded directly from the boat. The rich and mighty socialize, wheel and deal. It is a vision of power, wealth and astonishing beauty. We finished our Grand Canal tour at the Piazza San Marco. 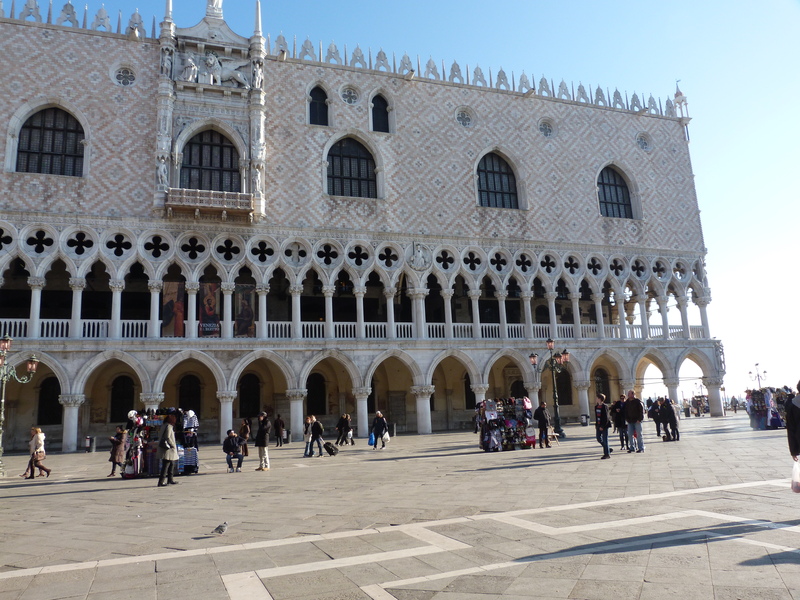 But we decided that we needed to wait a couple of days before submersing ourselves in the intensity of San Marco. 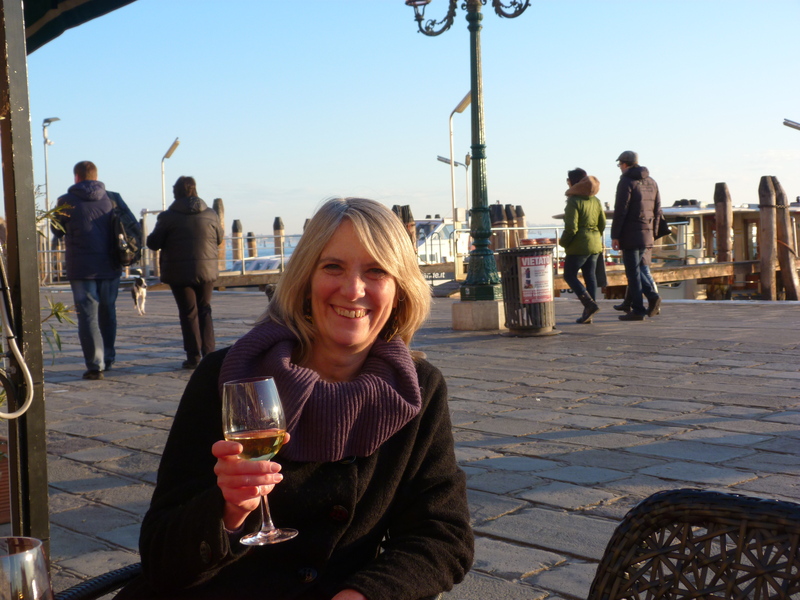 Instead, we walked away from the tourist hub, along the cobbled seaside walkway, far enough that we could find a glass of wine that we could afford (the closer you are to San Marco, the more expensive the wine, and the seats). 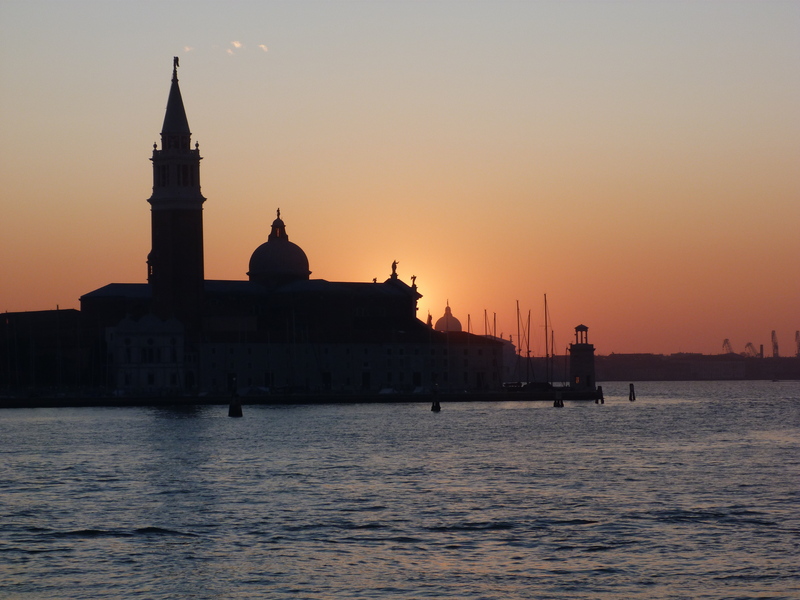 We watched the world go by, the boats heading to islands, the sun starting to set behind the island of San Giorgio Maggiore. As the dusk set in, we headed back through the narrow streets, finding new adventures around each corner. Exquisite architecture, extraordinary sculptures in every piazza, and more galleries than a person could see in one lifetime. To say that Florence is a city dedicated to art is gross understatement.Of course it is also filled with tourists and an infinite number of reproductions of Michelangelo’s David in all sizes and mediums. For me, the challenge was to try and come to the art with a fresh eye, and see if I could find a real city under the excessive tourist trade. The David must be the most reproduced image in the world. Making the pilgrimage to see it “in the flesh” felt a bit false. A bit touristy, to say the least. Apparently 5 people a year die when they see David. True fact. Knowing this, could the sculpture possibly live up to the hype? We gasped. Our jaws dropped. We were weak in the knees. Words will not do. Art critic Giorgio Vasari stated in the 16th century that there really wasn’t any point in looking at any other art. He was probably right. Michelangelo was 26 when he began his commission on the sculpture. It took him only two years to complete. I felt as though I could have stayed routed to the spot for at least that long. Gradually we began to breathe again, and slid away to see other works in the Accademia. There was a show of beautiful sculptures by Lorenzo Bronzino (19th century) that included his exquisite Nymph with Scorpion. But we kept circling back and paying homage and burning the experience of David into our hearts and minds. We needed to be able to withstand the streets immediately outside the gallery, filled with David T-shirts, key chains and mugs. 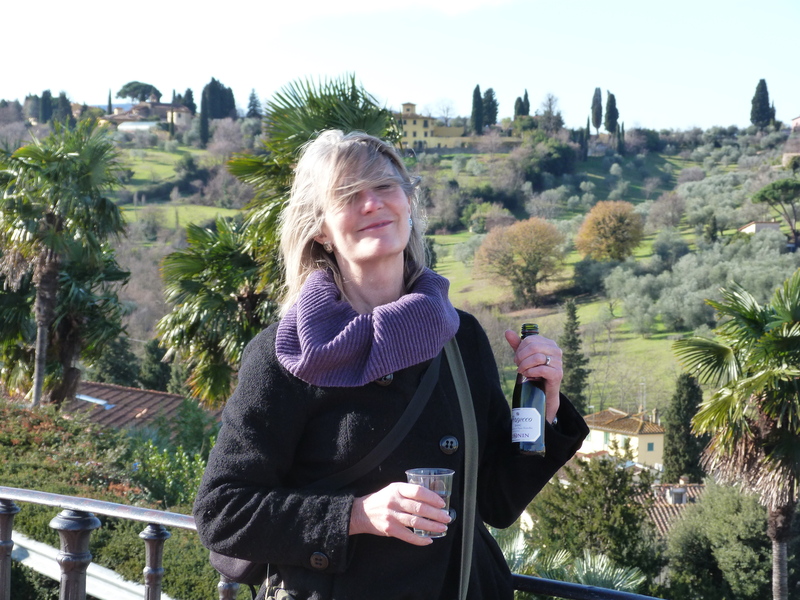 Our trip to the Uffizi was moving on a more subtle scale, both of us soaking up the perfect Botticellis, every golden hair in perfect harmony with nature. The Uffizi building is in itself a marvel, with glorious painted ceilings, and an art collection developed over four centuries. It has a grand, dusty, jumbled up feeling that is drastically different from a contemporary, antiseptic gallery. 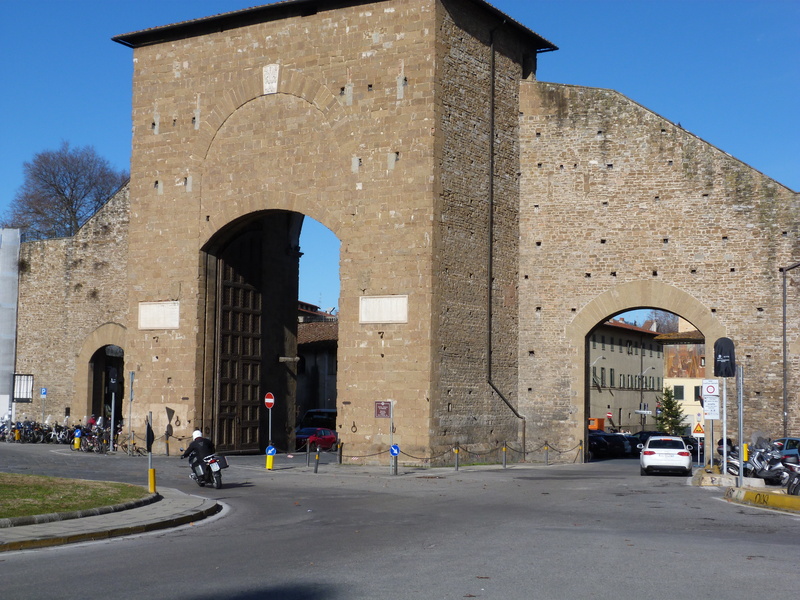 It was built in 1581, by Granduca Francisco de’ Medici, son of Cosimo Medici I, and although there have been a few renovations over the years it has not been modernized in the least. It is an intense place. There is just so much there. You could go every day for a year and see something new each time. Tim and I travelled in different directions, at different speeds, and compared notes over afternoon macchiato having only just touched the surface. The next day was Epiphany, and a chance to connect with Florentines outside of the galleries. Epiphany is an important holiday in Italy. Many businesses are closed and families celebrate the arrival of La Befana. According to legend, the Three Wise Men, when looking for the manger, asked directions of an old woman. They told her where they were going and invited her to come with them, but she said she was busy. A shepherd did the same, but again, she didn’t go. Later that night, when she saw a great light in the sky, she decided to go, bearing gifts that had belonged to her own child, who had died. But she got lost and never found the manger. Now La Befana flies around on her broomstick on the 11th night of Christmas (January 5), bringing gifts to children who have been good and coal to those who have been bad. We began our Epiphany celebrations on the Piazza Michelangelo, high above the city of Florence. La Befana bought me a glass of Prosecco from a roadside stand to celebrate the day. 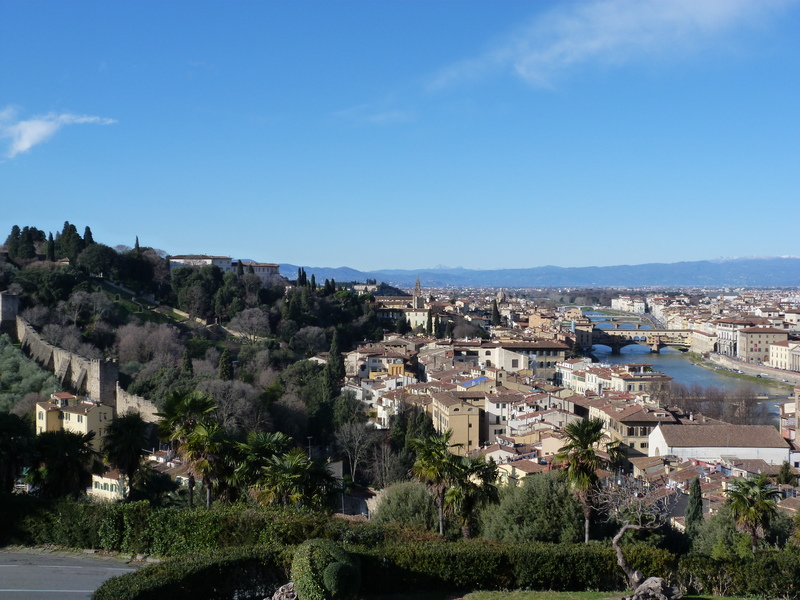 Piazza Michelangelo offers an amazing view of the city. You can clearly see the old Roman wall and fortifications delineating the separation between the city and the country. We walked high above the town, to the old Roman gate of the city, past palaces converted to luxury hotels and vast Italianate gardens. Well outside the tourist area, we were able to get a good, simple lunch of risotto and a great salad of thin shavings of fennel, orange slices and black Sicilian olives at a neighbourhood café. 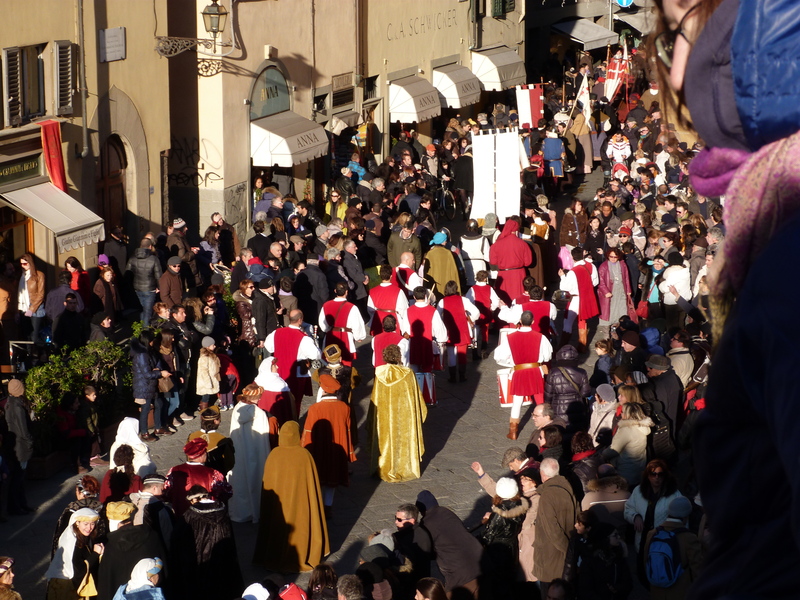 We headed to the Piazza Pitti for the Epiphany parade. 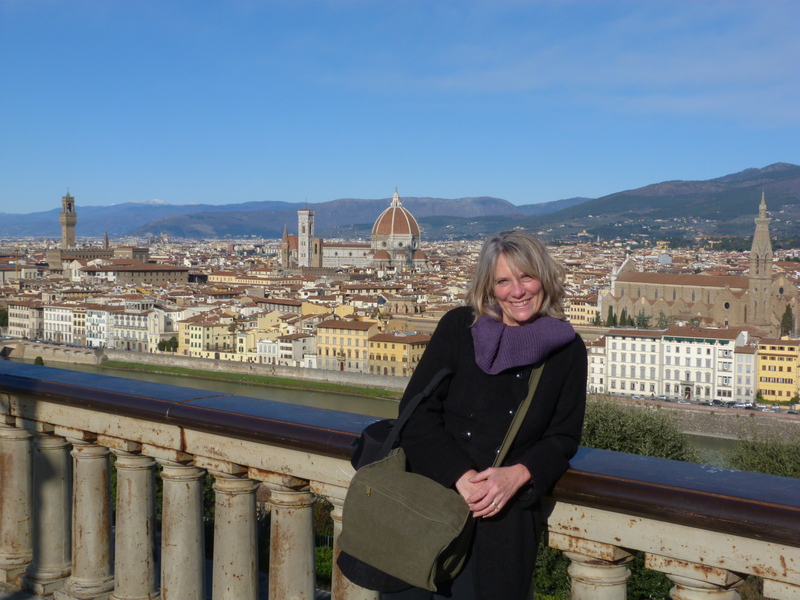 Being in this section of Florence, on the other side of the river Arno, we felt like we were in an entirely different town. 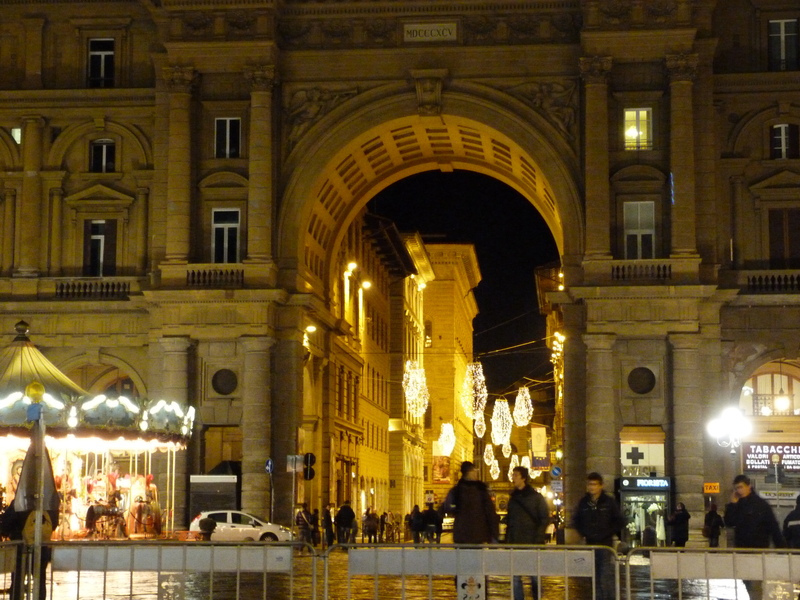 Although there are many galleries that surround Piazza Pitti, we were there to feast our eyes on the “Cavalcade of the Three Kings” and to see Florentines out enjoying a holiday. The parade participants were just gathering, preparing for the long walk through the city to the Duomo in the centre of Florence. Last minute costume adjustments. 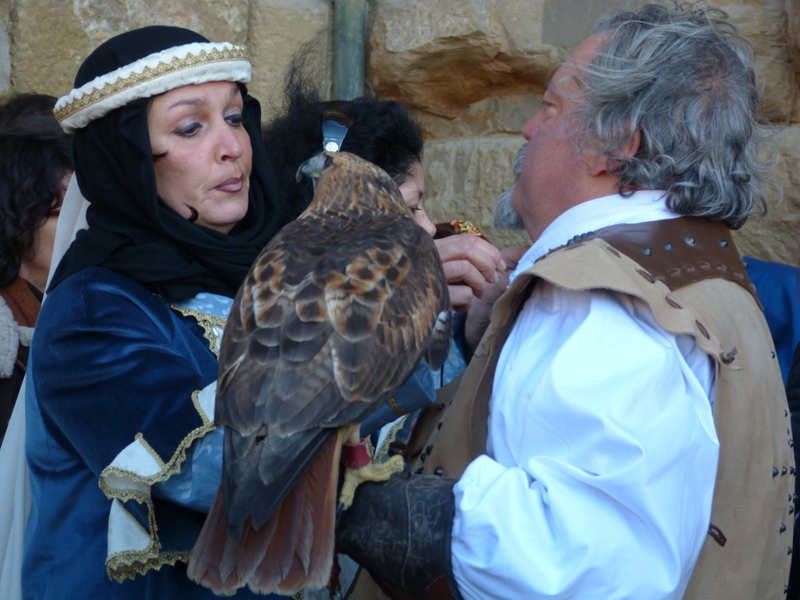 The falcon is very real. 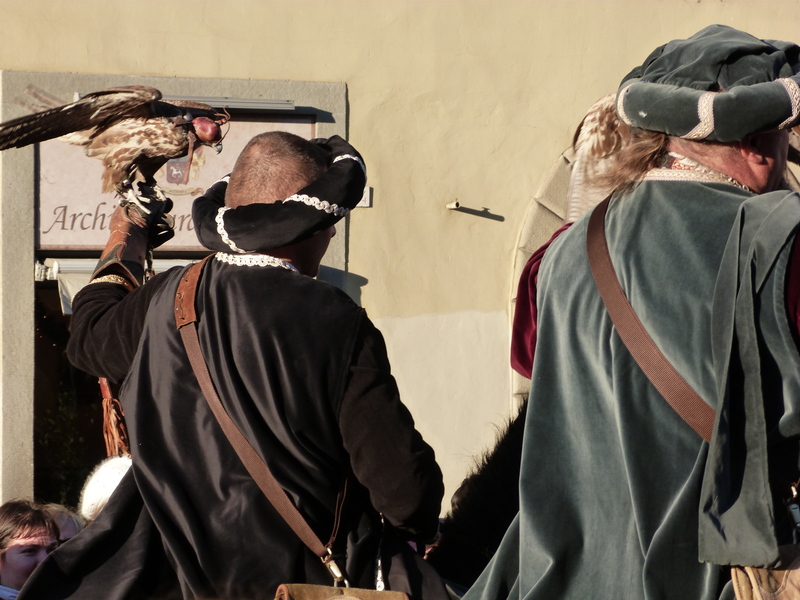 Various guilds, all in 15thcentury dress, were responsible for sections of the parade. The Three Kings made their way first, followed by a shepherd and dignitaries on horseback. 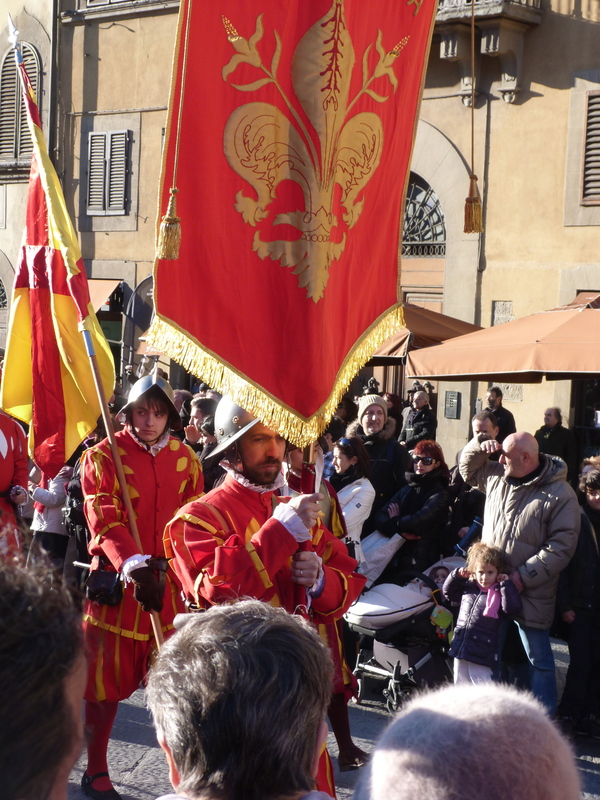 There were drummers, flag throwers, men at arms, beautiful couples, aging royalty and children – all very serious in their slow studied march through town. The Piazza Pitti filled with spectators of all ages, on the streets, hanging out of windows, to watch the parade go by. It was a celebration of life, of a proud history, of a very real and very beautiful city. Travelling in the off-season is terrific. Fewer tourists, lower prices, you get an honest feel for a place. For the most part, the weather has been fabulous. There has only been one day when we were badly rained out and that was when we met up with Xan and Meghan to go to see Siena. 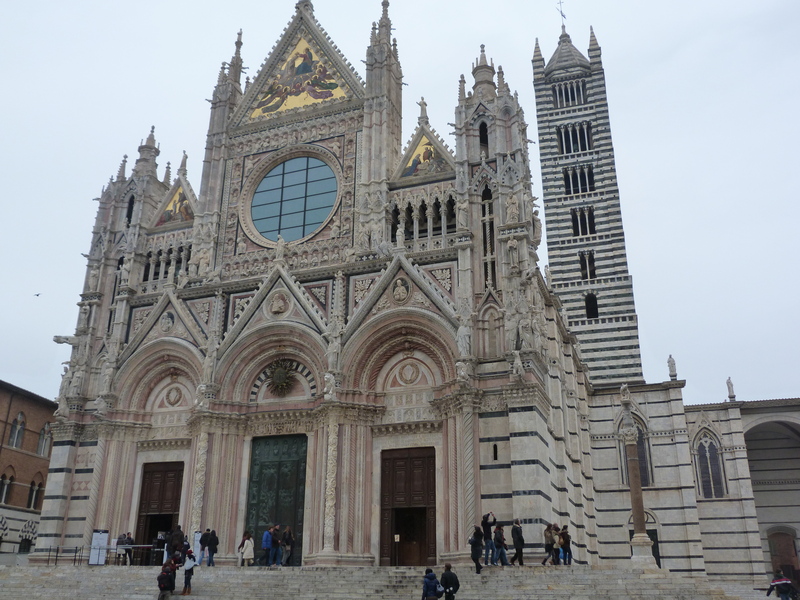 Siena is an extraordinarily beautiful medieval city that in its hay-day rivaled Florence. It was an important trade route between Florence and Rome and like Florence was filled with wealthy patrons of the arts. However, Sienna was decimated by the Black Death in 1348 and never really recovered its stature. What is left is like a time capsule, one of the largest and most beautiful medieval cities in Europe. 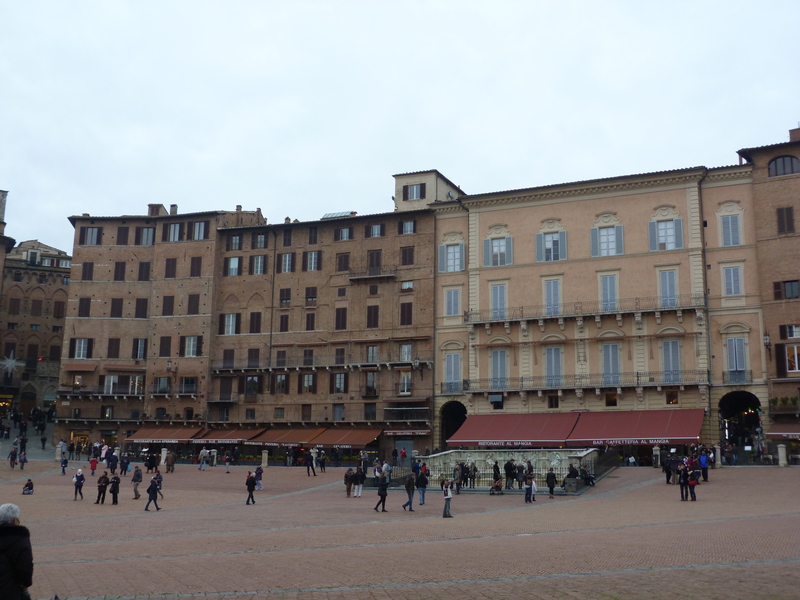 We arrived on an overcast afternoon to explore the grand piazza in the centre of town, the Piazzo del Campo. Famous for it’s curved scallop shape, it is the meeting place for thousands in the summer. We practically had it to ourselves, which gave us a chance to appreciate the grace and beauty of one of the largest piazzas in Europe. 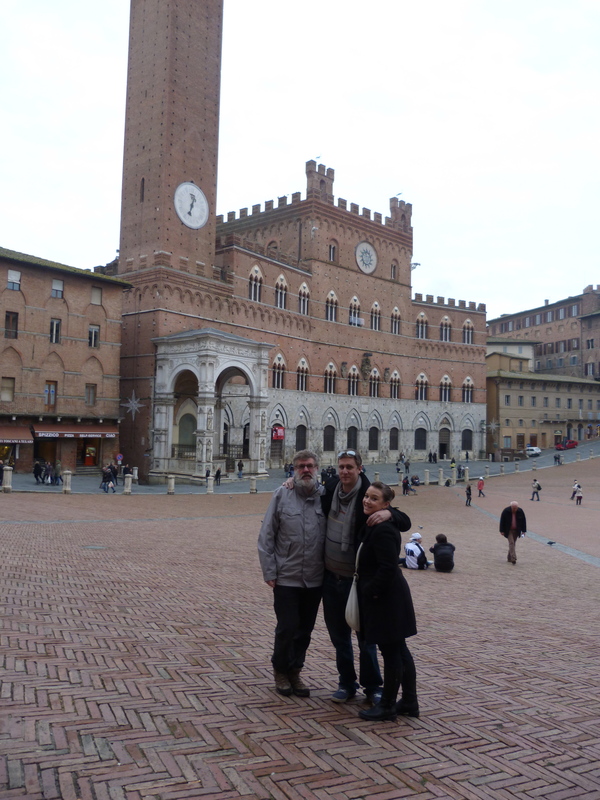 We had planned on climbing the famous tower, the Torre del Mangia, which overlooks the piazza. A great engineering feat in its day, the tower is 88 metres high. When it was built in 1338 it was was the tallest secular tower in Europe. 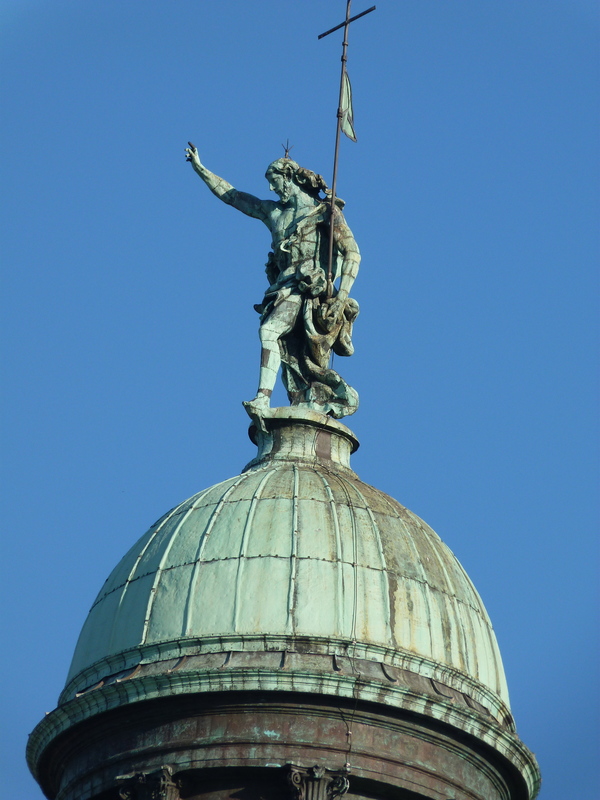 It was named after the first bell ringer Giovanni di Duccio, who was nicknamed “Mangiaguadagni” which roughly translates as using all of his money to eat well. We felt an immediate affinity for him. All of the guidebooks write about the gorgeous view from the top of the tower. But as we stood in line to go up and read the cautionary notes about the climb, we started to have second thoughts. Four hundred steps? Climbing up a tower that is, at some points, only 20” wide? With ceilings less than 5’? Not to be done by people who might suffer from claustrophobia or anxiety? To look out over a mist covered city on an overcast day? We decided to go have lunch instead and found a lovely place where we could sit outside under a plastic tent with heat lamps. We confined ourselves to a 2-course lunch, with fabulous local red wines, and delicious local specialties such as papparadelle di cinghiale (pasta with wild boar sauce). Feeling replete, refreshed and very pleased with ourselves (perhaps not unlike Mangiaguadagni), we headed out for a bit of sightseeing. Perhaps it was the wine, perhaps it was the teeming rain, but I was fully confident of the location of the one tourist place we wanted to visit, the Palazzo Pubblico, a gothic palace which is a museum of medieval art. We arrived, bought the tickets for a special tour and just as we started to go in realized that it was the wrong palace, the wrong tour. But there were only 6 people on the tour, 4 of whom were us, so we couldn’t retreat gracefully. Thus, we ended up touring the freezing cold palace of Palazzo Chigi Saracini, a palace built in the 12th century, filled with artwork collected in the 17th and 18th centuries. Reflecting the tastes of the last owner, Count Guido Chigi Saracini, we walked through room after room of quiet hideous Baroque furniture and excessively decorative paintings. The palace is now a music school, the Chigana Musical Academy, that was founded by the Count. The school has spawned many of virtuoso performers and is probably a great place to come for a concert in July. But the Count’s artistic tastes were not our own. Quite a hodge podge, in fact. The best part was the chance to see Liszt’s piano. It is very small. By the time we finished the tour it was almost dark. Rain was pouring down. We made a quick trip to the Duomo, which as far as Duomo’s go is of a manageable size. 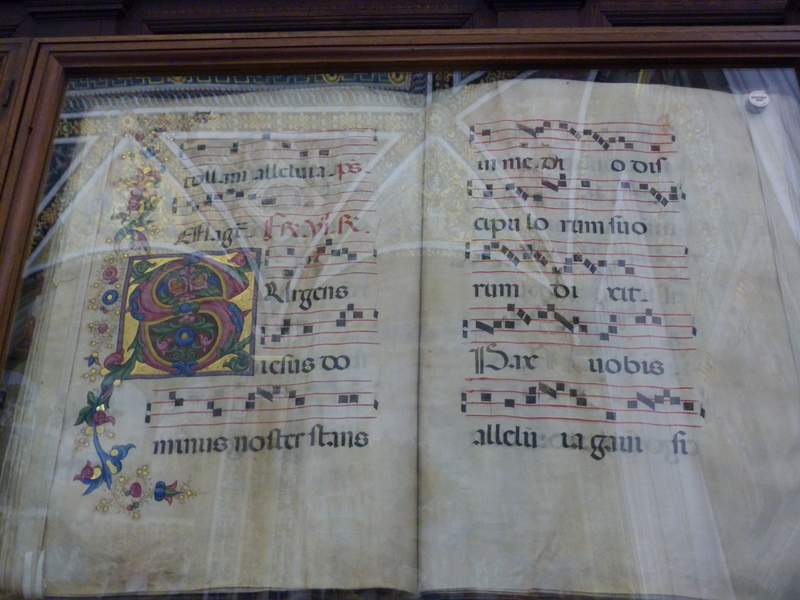 There is a small library attached, with a good display of liturgical manuscripts with gorgeous lettering and illumination. 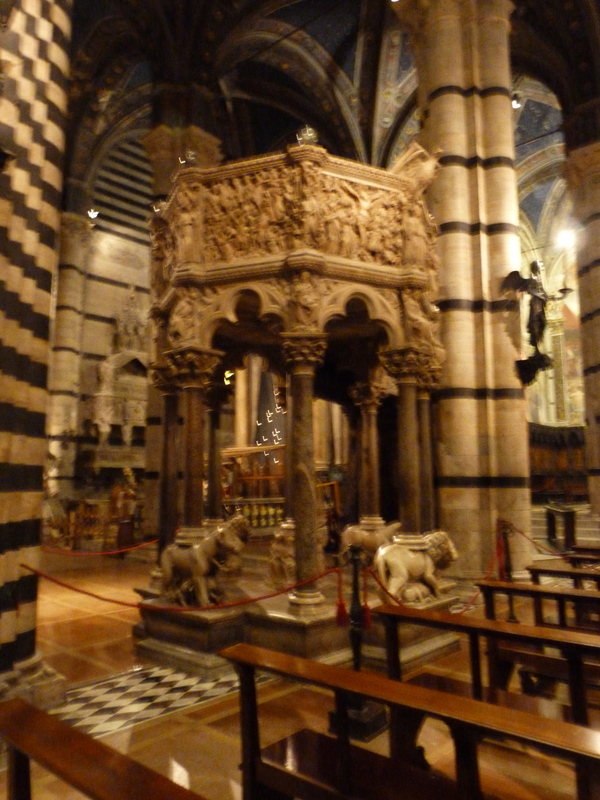 I particularly liked the Duomo’s marble pulpit, designed by Nicola Pisano in the 13th century, with four carved lions at the bottom. 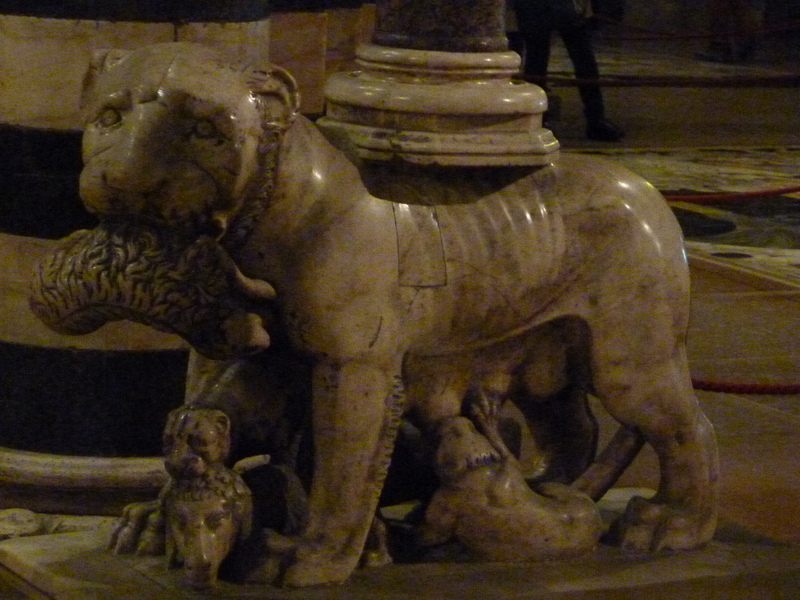 I felt a fondness for the lion that was eating one of the lambs. You just can’t tell with these lions. 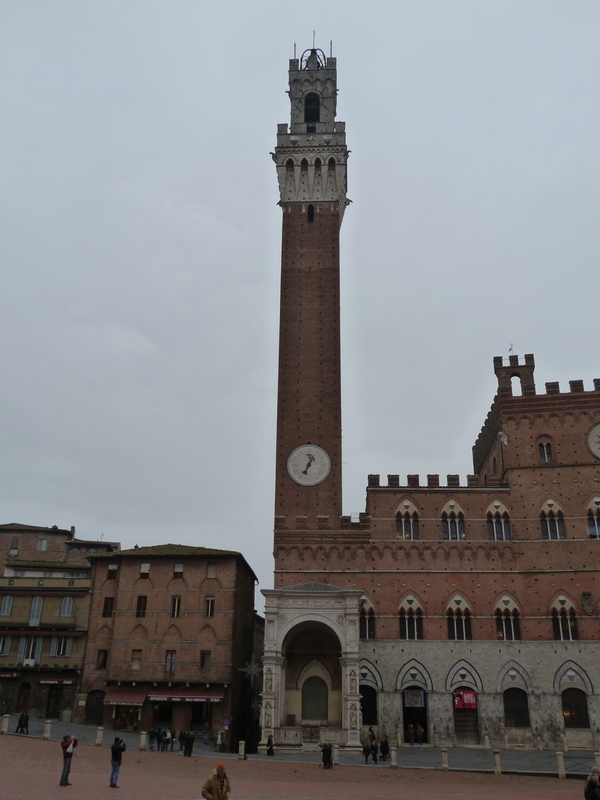 As we headed to the train station, wet and weary, we realized how little of Siena we had seen. It will have to wait for another trip, and a sunny day. We arrived back to the dry streets of Florence, under holiday lights, ending our glorious family holiday with a final dinner with Xan and Meghan before they made their way back to the ice and snow of Canada.